http://help.stormcarib.com/list.php?5. Please, share the information you have in these stressful times. There are some very good maps of the Yucatan at caribbean-on-line.com. I saved some impressive satellite images when Wilma was approaching the Yucatan. 3 hours and 28 minutes and its over!!!!! put the last of my generator gas into my car today!! Now maybe I can get a little sun in before the 24th of December (yes back to work)!!! I live in PaaMul, Q.Roo, Mexico [Yucatan Peninsula]. I know this side isn't an emergency site but I know also many PaaMulians and their families far away are using this site. I want to post a unusual message before wild rumors spread. Paamul after hit by Emily and Wilma suffered another tragedy tonight. 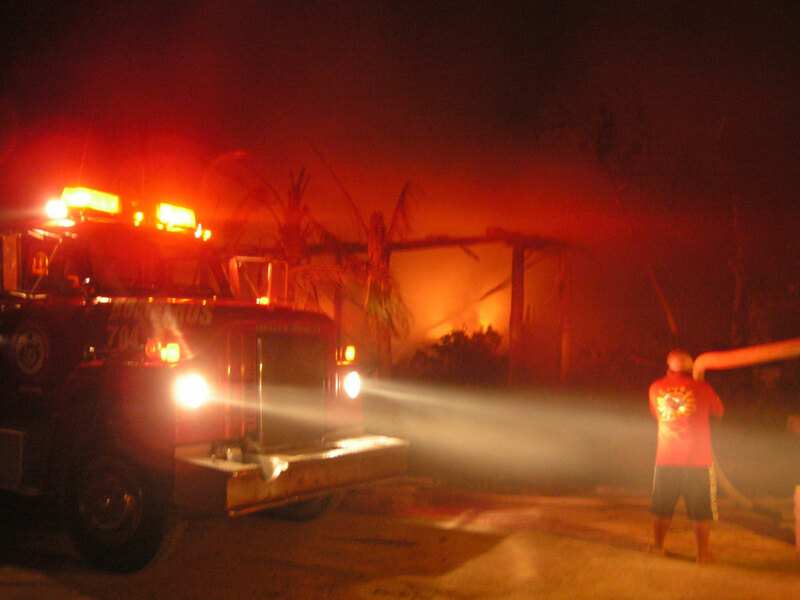 A fire claimed three homes: #54-CN, #55-CN and #56. The owners of all three were home. Scott [#56] got injured but I don't know how bad. Nobody else got harmed. The three homes burned to the ground. Thanks to the "Bomberos" [Fire trucks] and a bucked brigade of PaaMulians all other buildings are saved. Please if possible post this message on the site. I didn't like to do so without a request. Definitly, did not expect to make postings concerning "3 storms this year" !!!! Hopefully this one will be only a rain maker, and we do not loose power, so we can huddle on the coach and watch some movies, and anything else that comes up!! frank has invited you to view photos. 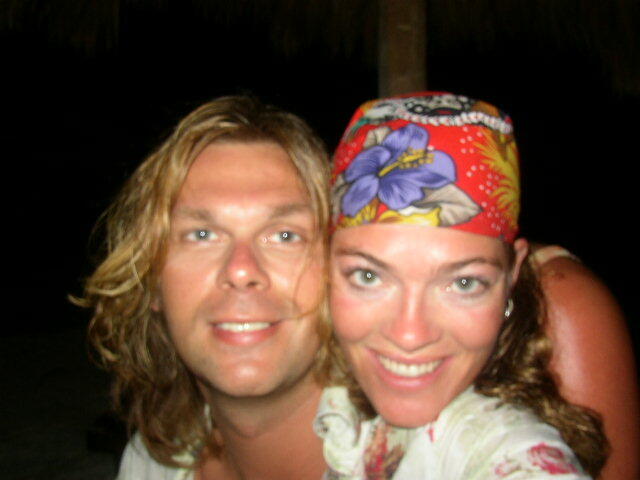 Just want to let you know that even in the Netherlands we are trying to help out in these hard times on Holbox.We are a couple that have spent the last four vacations on this beautiful island and are heartbroken about the fact that so many people are in trouble and in need of all kind of things.After we received E-mails from some of our friends on the island and San Angel we decided to start a fund raiser!! Media atention is starting te come as we will be giving interviews in the first week of december about why we are doing this. With this E-mail there is our first newsletter atached wich will be sent out to all major companies ,friends ,travel agencies etc. and a picture of us so you know who is talking to you!! If you have any post Wilma pictures that are not already on your site would you be so kind to send them to us? Thank you for reading and keep up the great work on your site!!! island is just 3 feet. house. EVERYTHING everyone owned is basically destroyed! 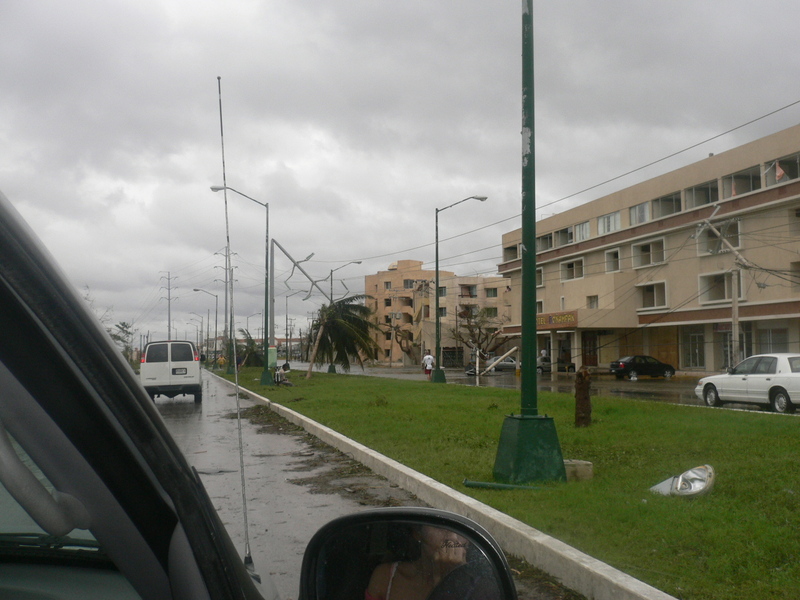 Further, there is NO ELECTRICITY 75% of the utility poles are down & twisted. produce Fresh Drinking/Cooking water without electricity. including gasoline, diesel for the electric plant, food, supplies...everything. 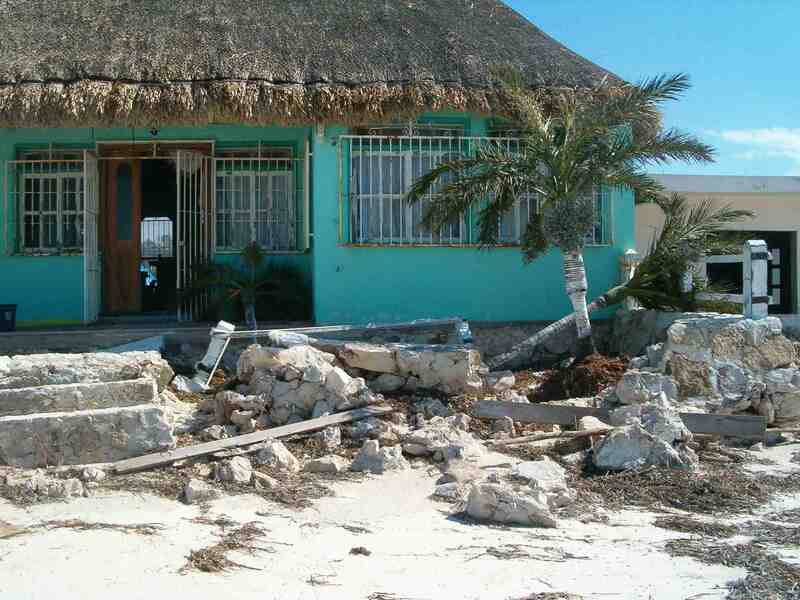 Hurricane Wilma devastated Cancun, Cozumel, Isla Mujeres and Puerto Morelos. These Tourist destinations normally supply 15 million $$$ of revenue PER DAY. SO WHAT DOES THIS MEAN FOR HOLBOX?? forgotten like yesterdays old news, and left to fend for themselves. motors, clothes, food, shoes, the basics simply to survive! 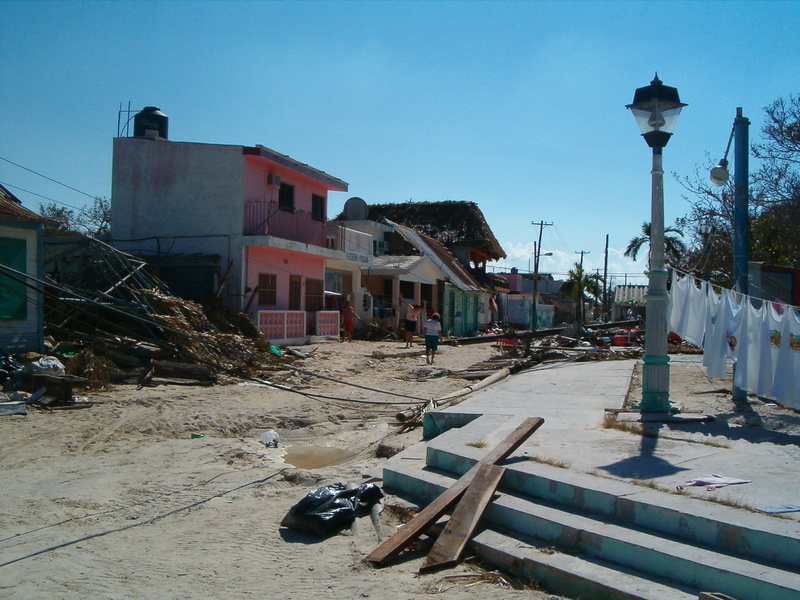 Can you PLEASE HELP the proud people of Isla Holbox. 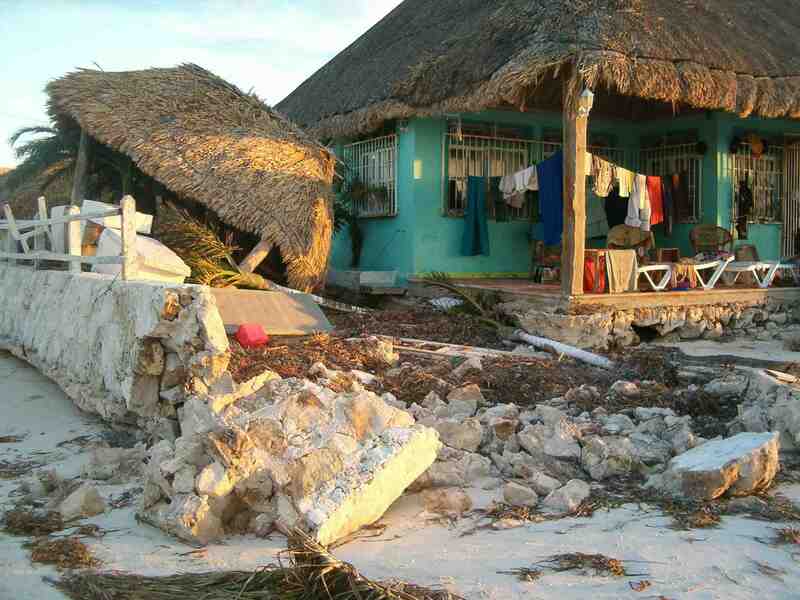 100% of ALL Donations will go DIRECTLY to HOLBOX AID. A SPECIAL ACCOUNT has been created for this Relief Effort. houses our meager office on Holbox. Texas. He is married to a Mayan woman and has extended family in the Yucatan. 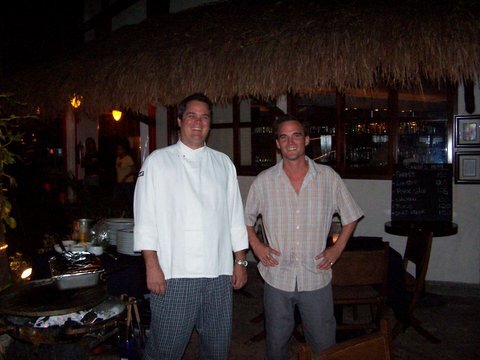 He presently owns and operates Holbox Tours & Travel. from his â??otherâ?? home in King City, Ontario Canada. Paul is in constant communications with Holbox's Mayor, Gamaliel Zapata Moguel. Bahia Principe Tulum will be fully operational November 1 and ready to receive a group from KDM Travel on Nov 7. Apple Vacations has been the first and only tour operator the past two days to operate charter flights from Cancun to get stranded passengers home. Yahoo News and MSN news are reporting that while thousands of Americans are still stranded in Cancun, the vacationers on vacation packages booked through travel agents are getting flights home. People who booked on their own are the ones still stranded. The good news in this story is that once again, ASTA's motto, "Without a travel agent, you're on your own" is playing out in Cancun. 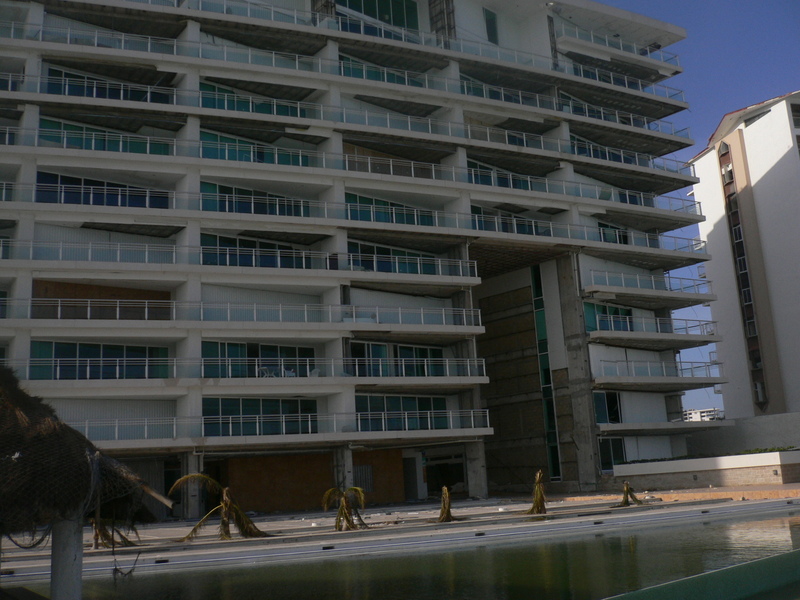 Iberostars reports that all four of the Iberostar Paraiso properties will be closed for at least a month and the Iberostar Tucan and Quetzal will not be accepting new arrivals for approximately three weeks. 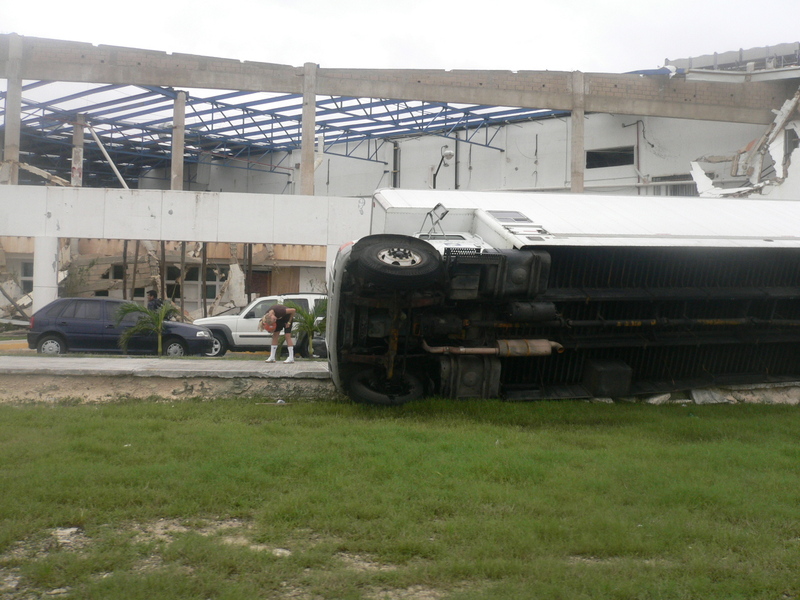 I just had clients in that were stranded in the hurricane at the Iberostar Parasio Maya. They couldnt say enough about Iberostar and Apple. 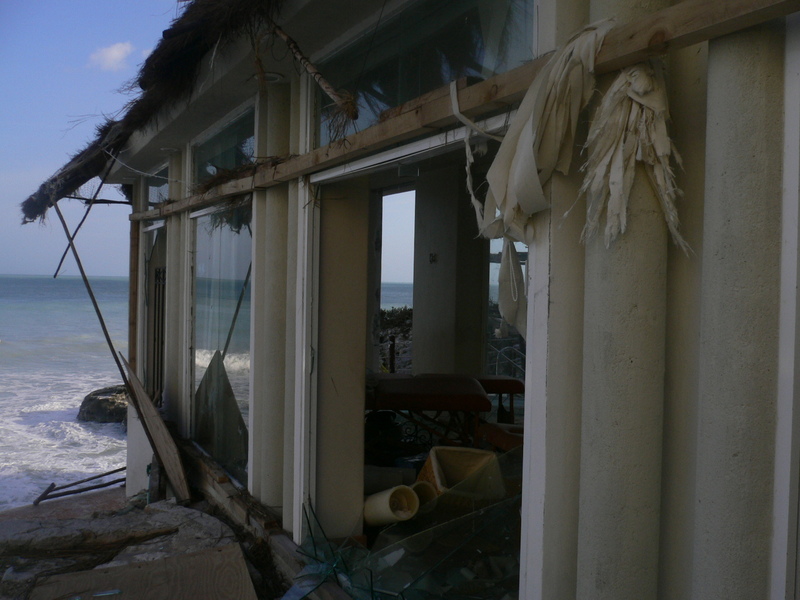 They were in the Sea Food restaurant at the Maya Thursday night to Sunday afternoon as their "shelter". They had 3 hot meals a day, all the water they wanted, and an attentant in the one bathroom cleaning 24 hrs a day. The Iberostar People went above and beyond. They stayed up on shifts all night to assist anyone that needed them. The guests took it upon themselves to take up a collection of 6,000.00 as tips for the employees. They gave them the cushions from the pool and bedding to sleep on. When it was over they said they would have a show Monday night. When my clients saw the show area at the Lindo totally under water they thought no way. Four hours later the employees had it pumped out, sanitized, bars open and the show went on. The end beach units have sand up to the ceiling. Some of the other rooms had windows out and some water damage. Their room was undamaged and looked great. The palm trees on the beach were shorn off, or uprooted. 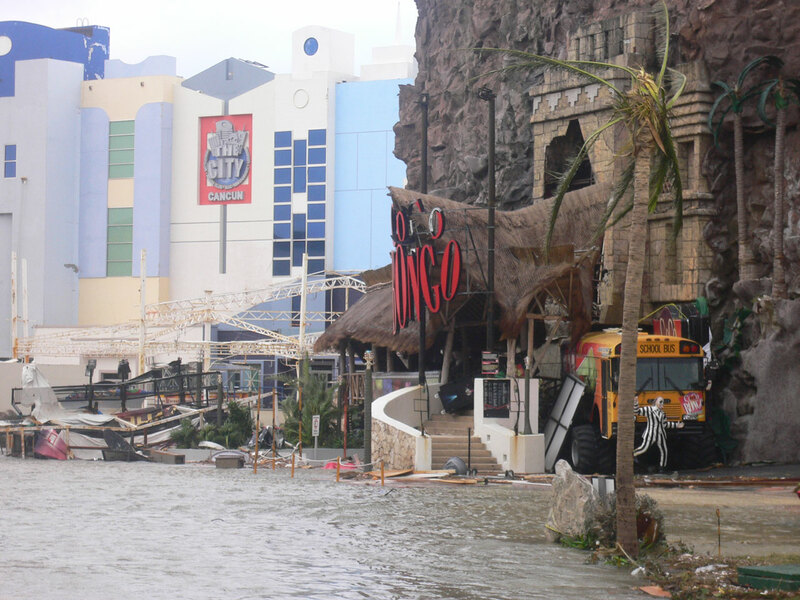 The two restaurants by the pool lost their roofs again (if you recall same thing in July but were fixed in 6 weeks). As far as Apple goes, the reps were great. They called the clients' room and told them they were going home the next morning at 9am. They again called at 4am and said be ready by 6am as you are on the 2nd flight home. All went like clock work. They said Apple was the only company with planes getting people out of there. They went to the street and flagged a cab who took them to his house and let them use his phone!!! 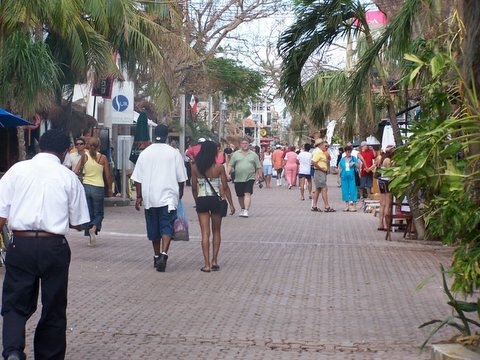 They also went to Playa and 5th Ave shops are wiped out. Other streets had shops opened already. My clients said they are going to write letters to Iberostar, Apple and anyone else to tell how well this was all handled. More updates will be sent as they become available. 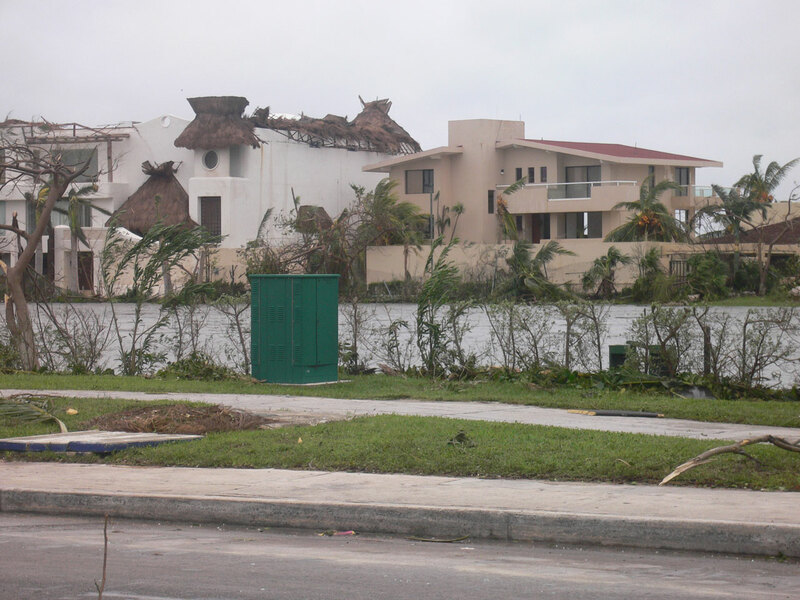 just had clients in that were stranded in the hurricane at the Iberostar Parasio Maya. They couldnt say enough about Iberostar and Apple. 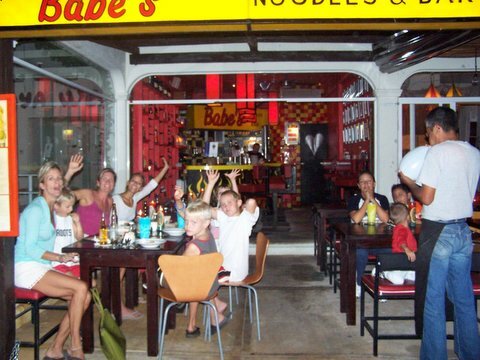 They were in the Sea Food restaurant at the Maya Thursday night to Sunday afternoon as their "shelter". They had 3 hot meals a day, all the water they wanted, and an attentant in the one bathroom cleaning 24 hrs a day. The Iberostar People went above and beyond. They stayed up on shifts all night to assist anyone that needed them. The guests took it upon themselves to take up a collection of 6,000.00 as tips for the employees. They gave them the cushions from the pool and bedding to sleep on. When it was over they said they would have a show Monday night. When my clients saw the show area at the Lindo totally under water they thought no way. Four hours later the employees had it pumped out, sanitized, bars open and the show went on. The end beach units have sand up to the ceiling. Some of the other rooms had windows out and some water damage. Their room was undamaged and looked great. The palm trees on the beach were shorn off, or uprooted. 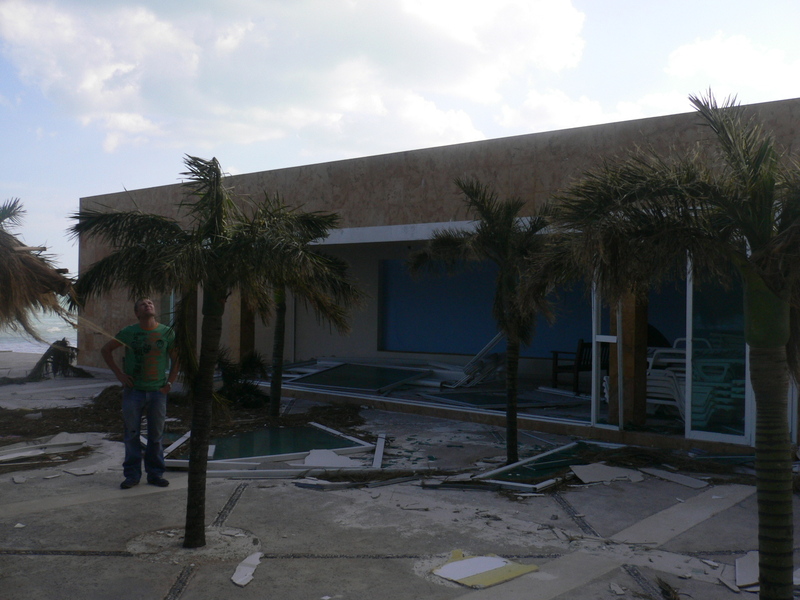 The two restaurants by the pool lost their roofs again (if you recall same thing in July but were fixed in 6 weeks). If you'd like to share these and other MAST news messages with the rest of your agency, we can send messages to them directly. Just let us know who should receive messages (full name) and their email address(es). We'll take care of the rest. For more MAST information, news updates, and everything MAST, visit http://www.mvptravel.com/. For more MAST information, news updates, and everything MAST, visit www.mvptravel.com. �       The Cozumel Airport officially reopened on October 29, 2005.
resumed its Houston-to-Cozumel flights, operating three flights a week. �       The first cruise ship is scheduled to arrive on November 14, 2005.
are reported to be in good condition. did not sustain damage and are open. �       Punta Sur ecological park is currently open for jeep tours. 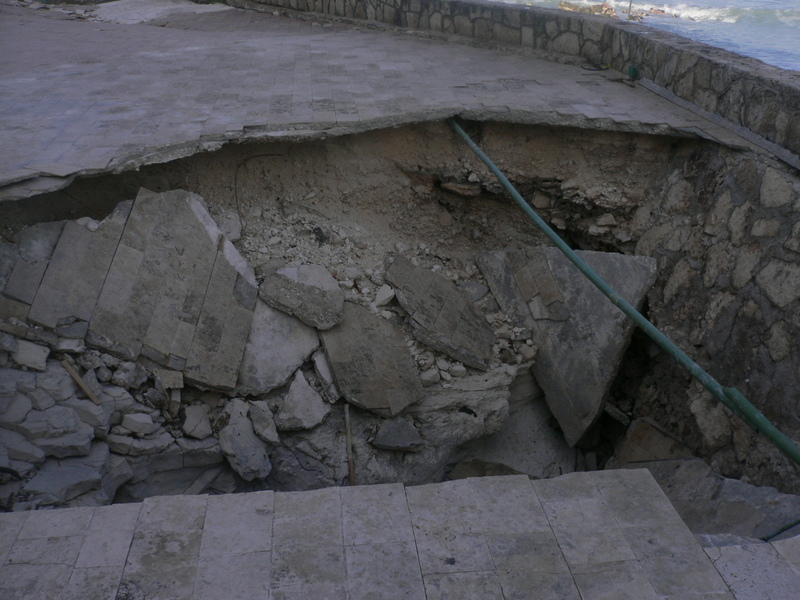 archaeological site will reopen on November 14, 2005. Just a short note to tell you about Caribe Blu Hotel and Blue Angel Dive Shop. 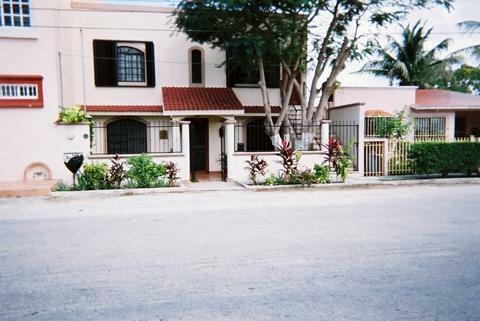 We are located on the ocean - 2.3 km Costera Sur in Cozumel. Our hotel and dive shop is built between the coast road and the ocean. 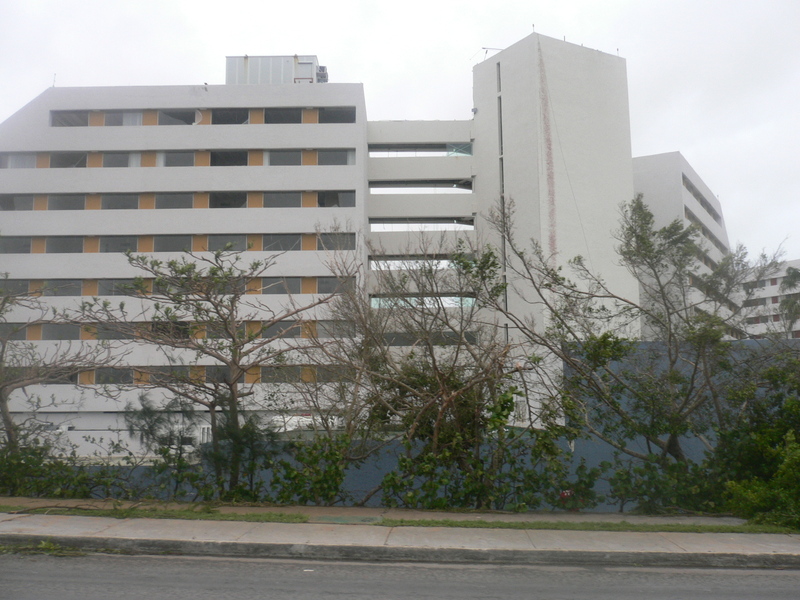 We are in the process of repairing the Caribe Blu Hotel will be open again on November 20, 2005. We were told by the Marine Park we are able to go back to work, taking divers to the reefs, but must let the Marine Park know which reefs we will be diving. SO BLUE ANGEL DIVES SHOP WILL START BACK TO WORK TODAY (November 8, 2005) DIVING AGAIN! Our boats are cleaned and ready to go! 6 divemasters went out diving this past Saturday and found the reef have definitely changed - they all were dropped in different places and surveyed a different reef or sections of reefs. They found so many fish, turtles and even eagle rays and sharks in abundance. The landscape of the reefs have changed. Sand has been added in some places and taken away in others. Some swim-throughs have disappeared - and other new ones appeared. The soft corals seemed to have taken the biggest hit, especially in the shallow sections - seems that when you go a little deeper - about 80 feet - there seems to be little or no damage found. A new diver to Cozumel would find diving Cozumel spectacular - where a frequent diver to the reefs - will notice some of the changes. 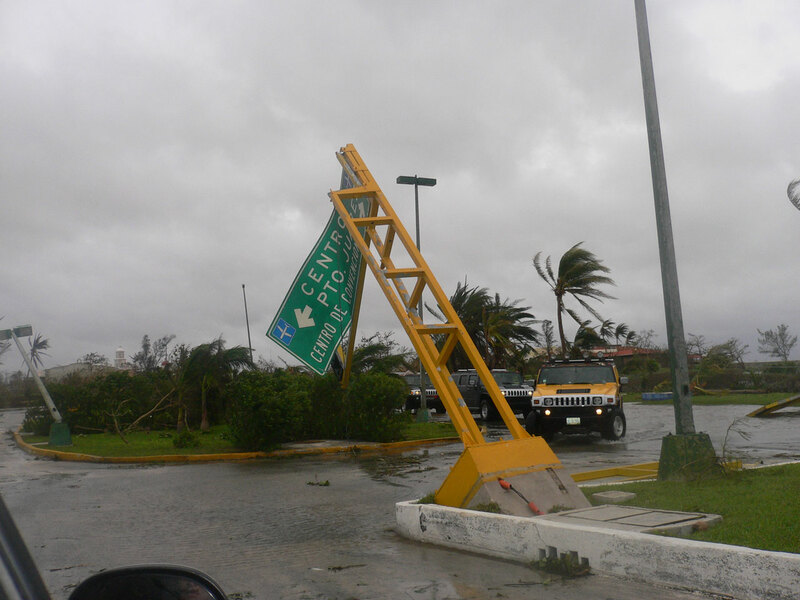 Electricity has now returned to over 90% of Cozumel. This I think is amazing! 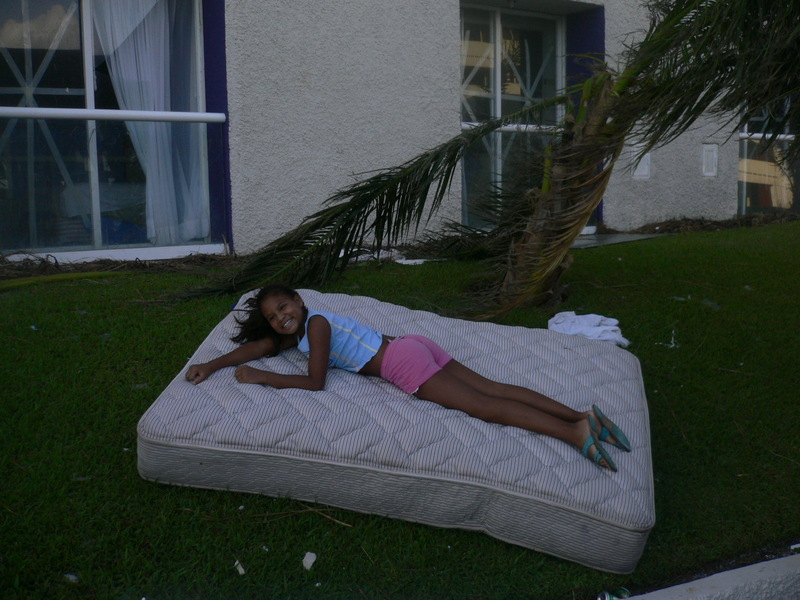 The people of Cozumel are also AMAZING - they are all helping to clean the debris from the streets. Right now there is NO travel to Cozumel - but the president of Cozumel has declared that on November 14 - cruise ships along with other tourist will be allowed to return to the island. At the hotel and dive shop - all of our people, divemasters, cooks to Captains (even Victor) are helping clean up. The grocery stores are open and all well stocked. It is getting better each day - and the clean up is progressing. Email us for more information or for reservations! to, but thought i would just send them in case people were interested. people, just thought i would pass along the pics of our experience. First timer on Storm Carib. Mujeres expect to have full services by the weekend. Tomorrow, they expect to open the toll road between Cancun and Merida. Aquanauts is Diving & Snorkeling. replacing all of our roof tiles. We wish them godspeed! I have been following your reports, Post-Wilma. Thank you very much for your hard work. 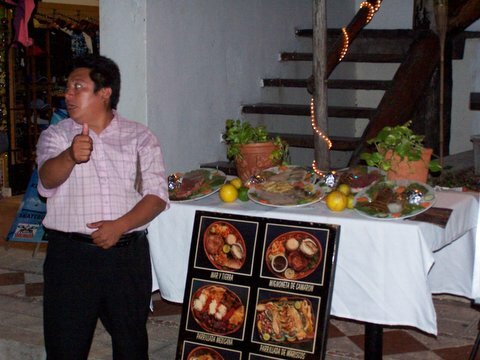 I have known the Alcalde since he was a child and he is an honourable man who will make sure that every dollar or peso goes directly to help the village of Holbox. Thank you for your efforts. Regards, P Harding. I got the following forwarded by Dan Schierman. opening dates of many hotels in the area. 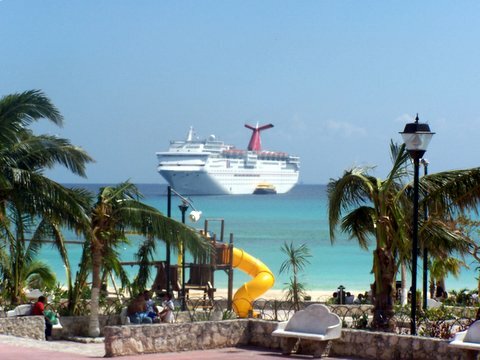 Make that "Carnival has arrived""
Several Cruise lines have begun diverting cruise from Cozumel to Playa Del Carmen, with the 1st one arriving today!!! 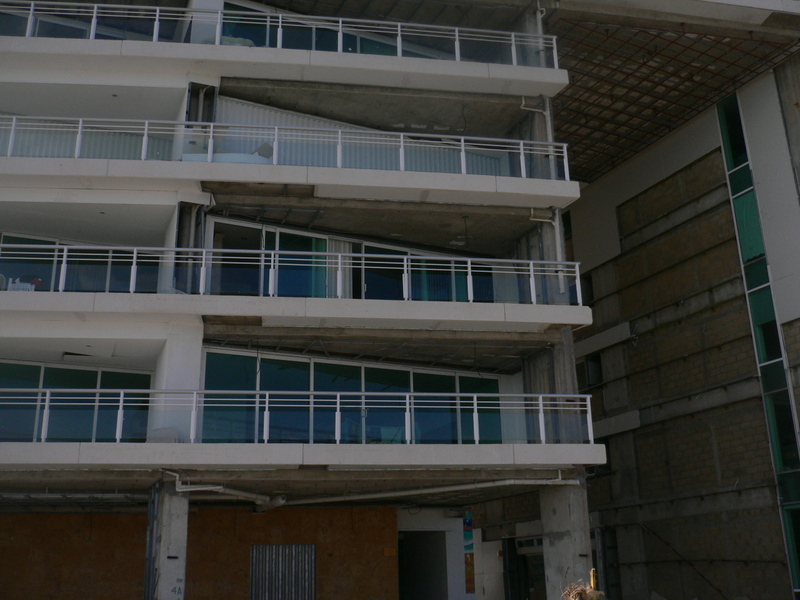 Playa Del Carmen's infrastructure is almost 100%, but we lack tourist in the hotels, these cruise ships will be a welcome addition for our area!!! Since we have always lacked the cruise ship terminals, folks are being tendered in to docks, just like the old days!! Rodrigo's caption: "Take A deep breath first"
Title: You have been invited to view mike hopson's photos! mike hopson has shared photos with you. Do more with these photos! 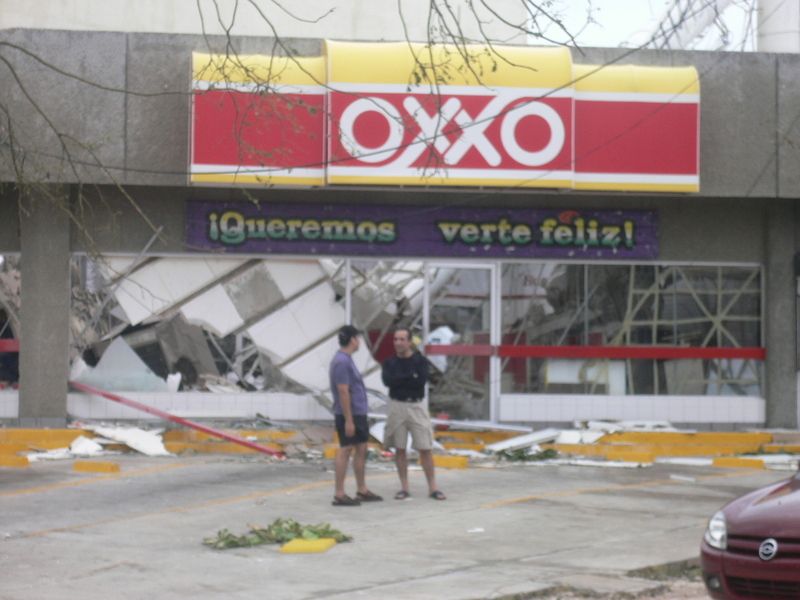 - "Cancun: Yes, We're Open!" This has been posted before, but this site is keeping very up-to-date sets of pictures of Cozumel, day by day. 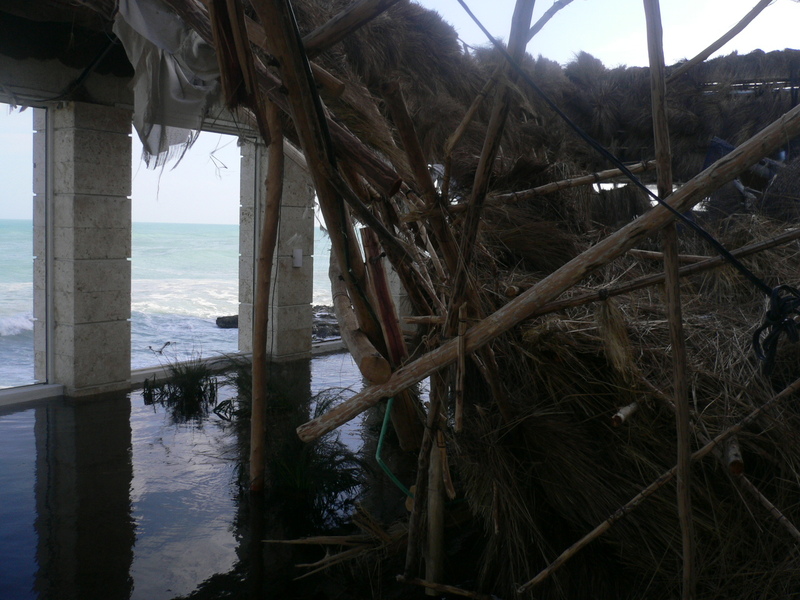 The destruction is widespread, but the pictures of the intensive clean-up, repairs, and influx of relief supplies is just as impressive. Apparently they are reopening November 5 already! Well we made it through the storm. Without a doubt the most nervous 48 hours of my life. Once it started it did not want to end. Terrific winds and waves, but we were never threatened by storm surge at the house. Had a total of 6 people staying there including me. There is no power and very few functioning phone lines. Luckely, I do have a generator and so life is not so different as before. I had to come to Playa del Carmen to use the internet and several of us are here doing laundry as well. Our town is recovering quickly. 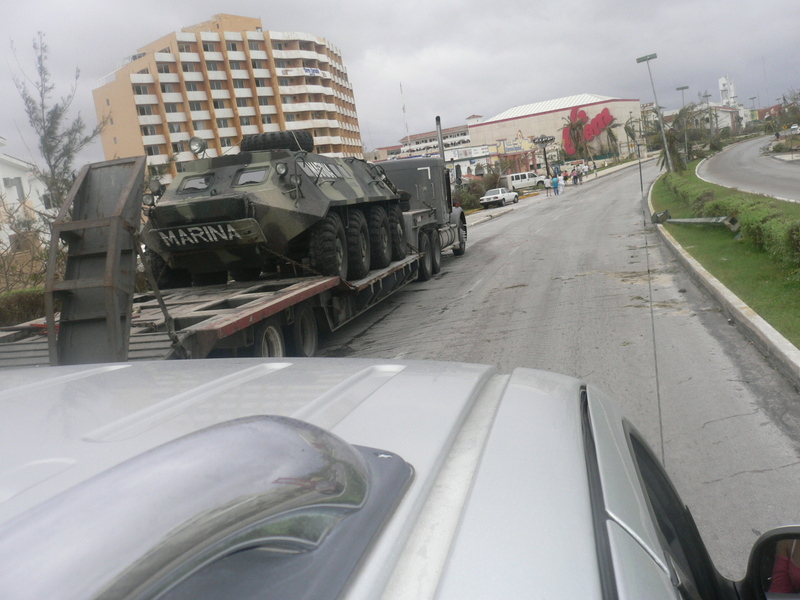 The army arrived soon after the storm (2 days) and immediatly started clean up operations and supplting food, water, and other supplies. For the 1st 2 days the only way into or out of town was to either swim or take a boat through the swamp. The town has really pulled together with cleanup and assisting those that need it. 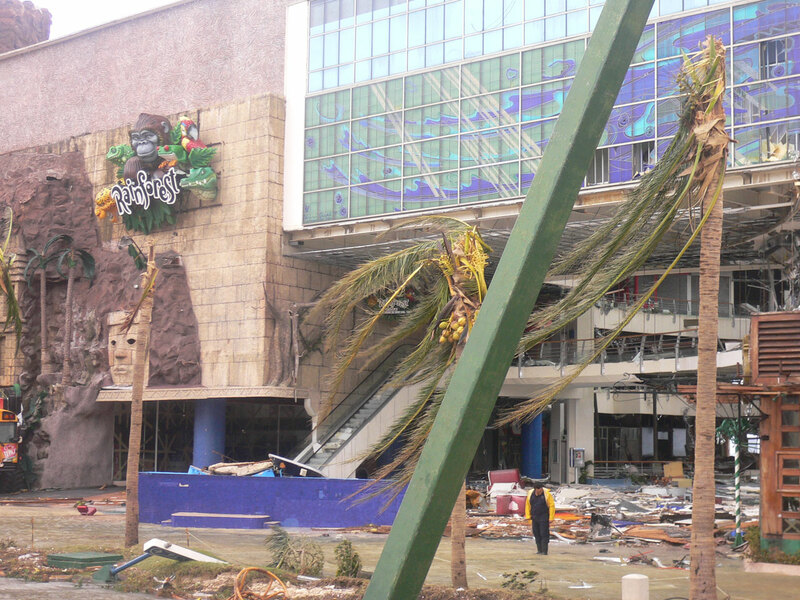 Most all waterfront properety was severaly damaged or totally destroyed. I will be posting pics as soon as I can get on line with my laptop. Playa Del Carmen is up and running!!!! Probaly 80-90% of stores and restaurants are open, and many of the area hotels will be fully up and running next week, but very few folks remain to enjoy. As others have posted, this area needs folks to return, if you had plans on visiting, please check with your hotel, if they are open, and you can get here, please come!! Subject: Re: CUN/COZ Airport - Now What? Mexican government has  performed fairly well so far with this crisis. 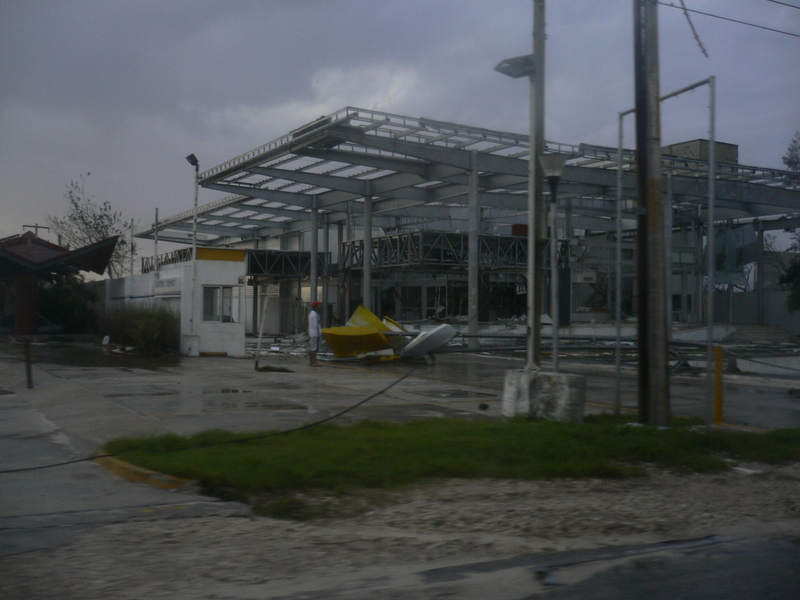 Cancun, Mexico (CUN) - The airport and local travel center  are closed. 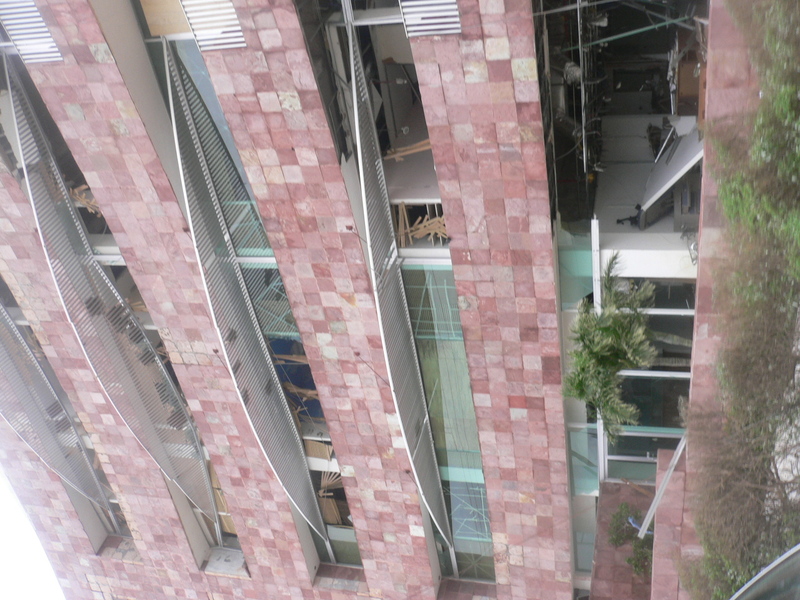 a local school,  Colegio la Salle. 15 through February 2, 2006.
for the most current information on your specific flight. One other note... I did hear today that a Playa neighbor of mine did arrive Wednesday into Cancun on a domestic Mexicana flight via Mexico City. The Mexican passengers were allow entry with no delay however my neighbor was not going to be allowed entry until they showed their FM3 visa and argued the exception. What is the deal? Is the Mexican government afraid that swarms of US tourists are suddenly going to decide to vacation right now in Cancun? I am sure the tourist industry south of Puerto Morales would however welcome some business about now. pls excuse ny typing, I lost 2 pairs of glass's in the storm, and am guessing where the keys are!! 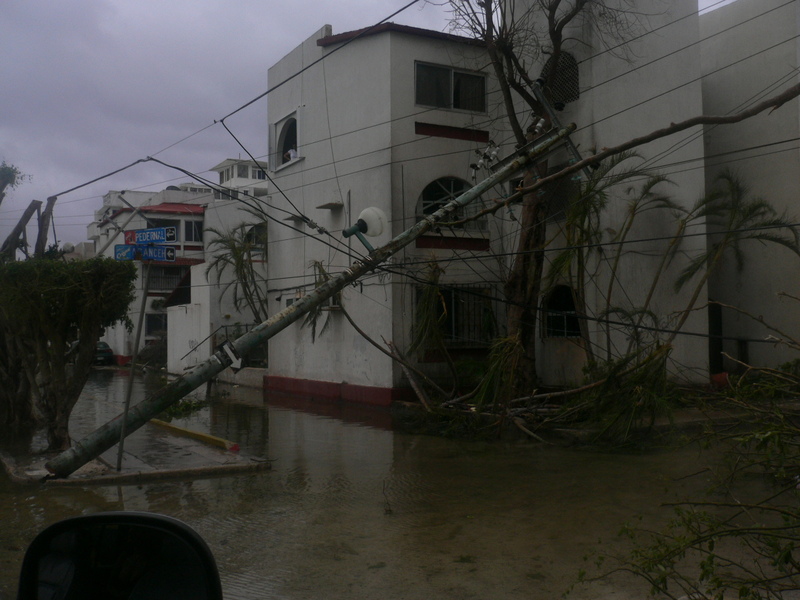 Yesterday we made 2 runs to friends in pto Moralos, ice water and food, they really got it, and no presence of help!! 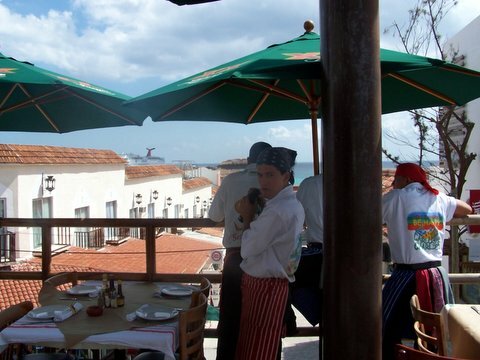 Today on the way to Cancun the pueblo was bursting with government activity!! If you have been here, you may remember the huge power lines running along the highway #307, from Moroles north they went down, we saw a convey of trucks to replace one of them, over 20 semi trucks pre fab, to replace one tower!! 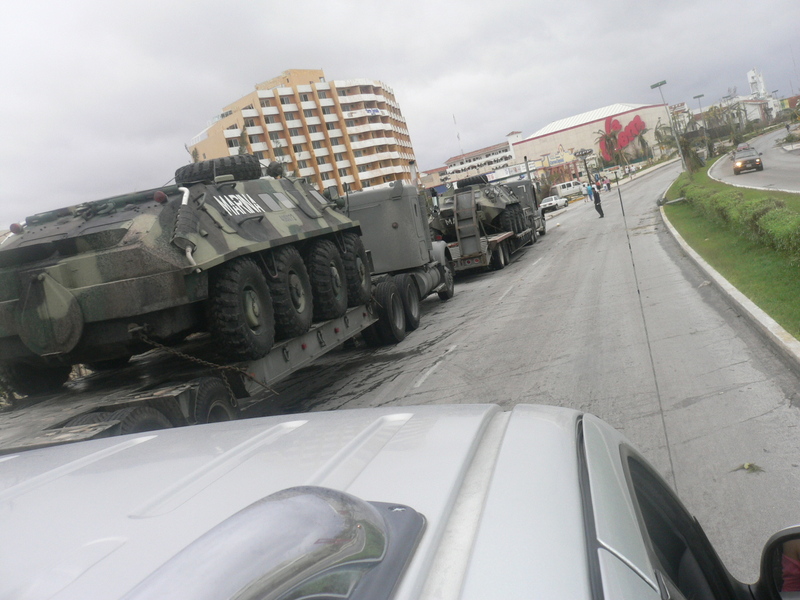 Cancun is under military control, soilders on every block, and military encampments every where, but what impressed us, soilders , government worlers, civilians workoink hand in hand , cleaning up. working on power poles , you name it!! Have talked to a few tourist stranded here, and all have been great impressions on how they have been treated, one guy was in a hurricane in Florida last year, and can not believe how effective the response has been here, he was with out power for 3 weeks, and we had power in 3 days!! Yes we may be down, But we are not out, and qouting a sign at the Cancun Hilton, we will be back better than ever!!!! Desire Resort & Spa reservations. 1. AIRLINES: American and Continental have offered full refunds. with a refund or a re-schedule of travel dates. for June 20-25, July 18-23 (takeover), August 15-20, and October 21-28. Check NFN Travel <http://www.nfntravel.com>  for other group dates. reservations for Desire, but all couples are welcome to join this group. Please call NFN Travel for these rates - they are too low to publish. give us a call and we will work with you to book the dates you prefer. (recommended), please contact your insurance company directly. original booking regardless of the applicable rate in effect in 2006.
reason to rebook for 2006. Received the following from Adrian from Especias through Marla Fisher. Thank you very much for beein in touch. water and all the services back. a month, as a limit, all have to be back to business. as well as punta langosta and the town one are in use already. restaurant is running already and the kiteshop as well. site and suffered no damage. It will be fully operational as soon as they can get it in the marina. 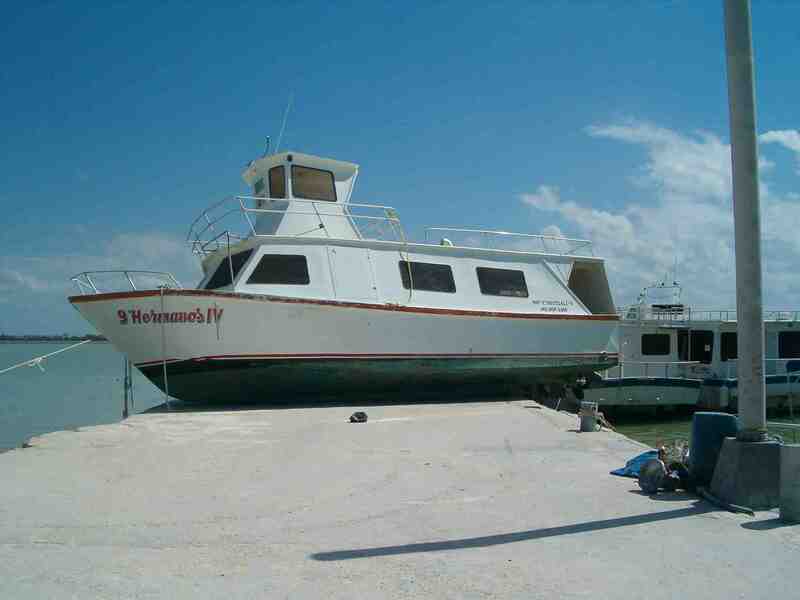 also owned by Albatros Charters) out for repairs as early as tomorrow. their are businesses ready to operate, and their boats have survived. I just heard that the Airport will close down once again tomorrow (Friday) and remain closed until November 20th. This info came from someone who works inside the airport and just left a meeting of the airports management company, ASUR. general guidelines for consideration which will be condensed into Dave's Rules. 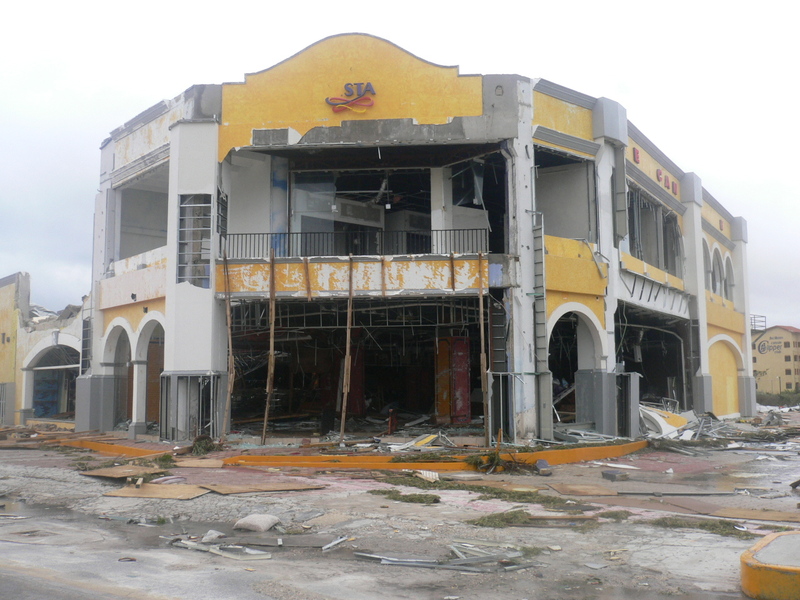 still a lot left in Cozumel, and what is a mess, will soon be cleaned up. should be serious concern about the possibility of reopening in the short term. however that some of them may never reopen. low season and even in normal times they are losing money by staying open. of the downtown hotels could be open tomorrow if power is restored. 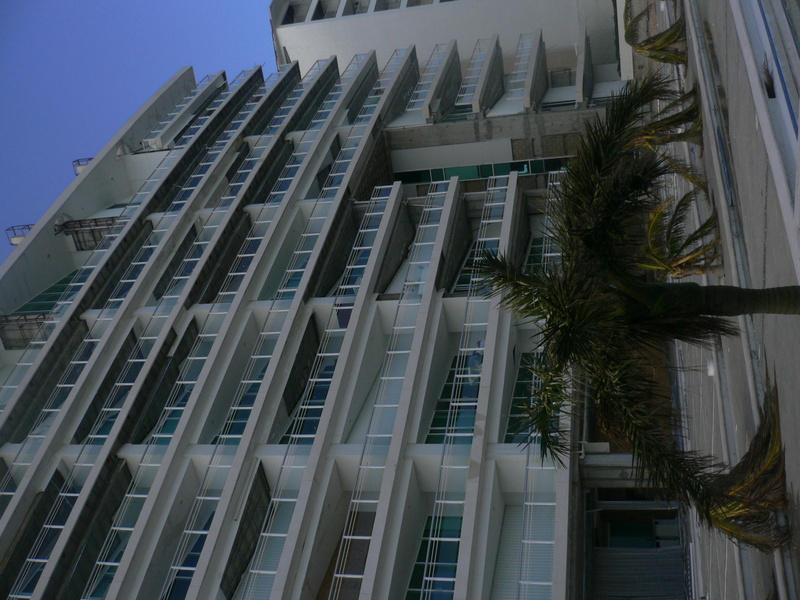 soon, but expect all off the water hotels to be able to open very soon. of your favorite places in Cozumel. of the island within 45 days, but that means every last palapa in the jungle. it is possible any time after November 15th. done in fairly short order. for our first 3 years of operation, Aldora Divers did not even have a facility. most dive shops will be physically able to be back in operation very soon. in business is another question. presence is all these people need, that is work and they know how to do that. hotel may never open again, but in every cloud there is a silver lining. rule #7? Come down and figure it out your own! Subject: 8am Thursday - Miracle recovery underway! got cut off. Cells still intermittent. appeared so far just cleaning and drying out. Hopefully he didn't lose much. have much equipment yet though and they are conserving gas with a few trucks. They drop workers off in a neighborhood so they go around working on foot. many "like flies") but that Cozumelenos are buzzing around everywhere. the reef/marine life conditions soon. buildings remain, just nothing inside them. the Pta. 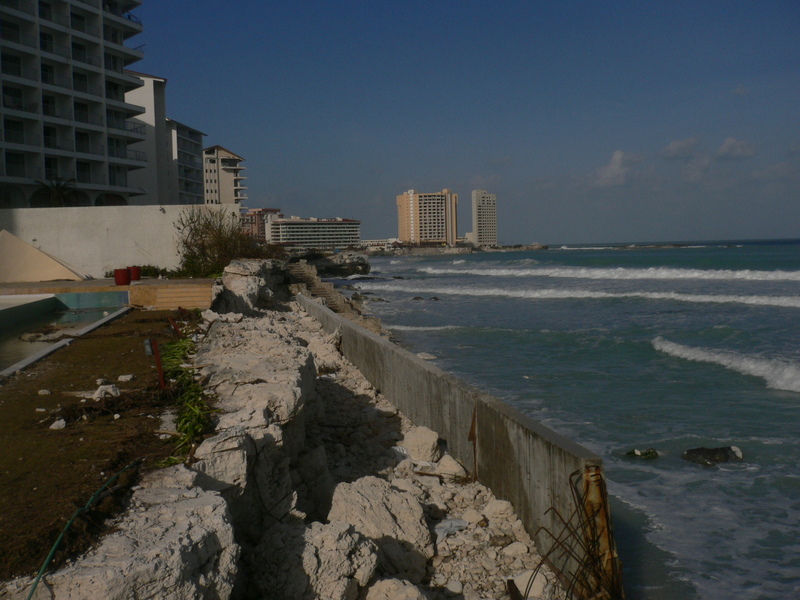 Maya pier and buildings are gone. town. 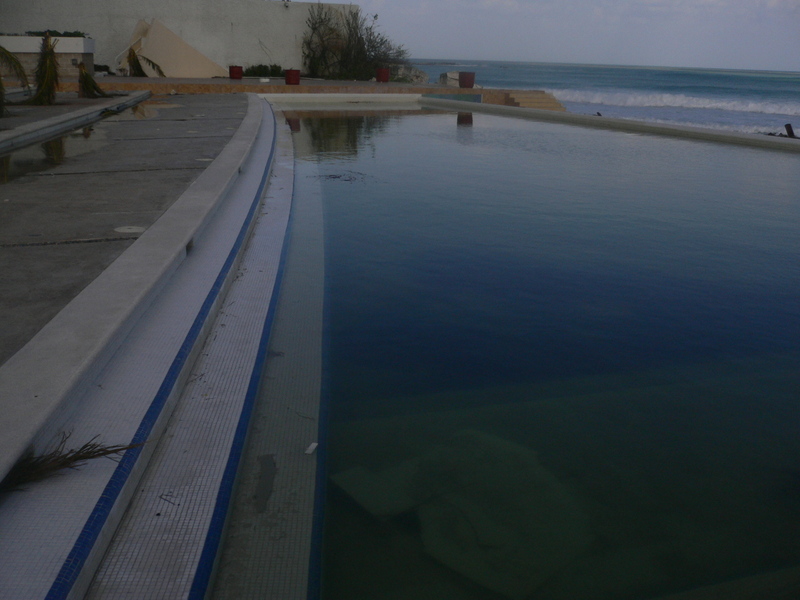 They removed all debris from pools in town and added chlorine. should have today) or electricity. whole crew feels the same, along with many others on the Island. told him unless he needs me for something to just call once a day. That we all trust him to do what he needs to do. weathered the storm with us and are still making their way back home. 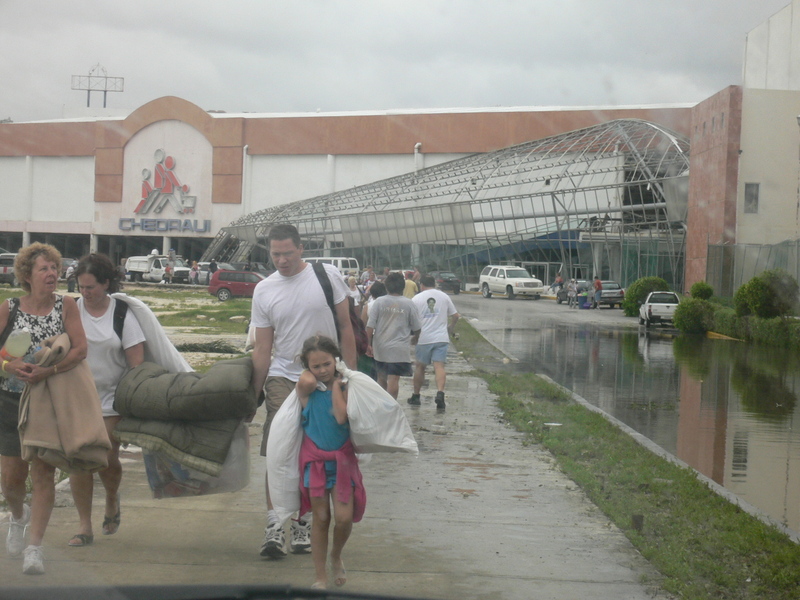 another 5,000 passengers departed via Merida's International airport. Today, 54 flights departed Cancun carrying an estimated 11,000 passengers. 8,000-10,000 domestic and foreign tourists. 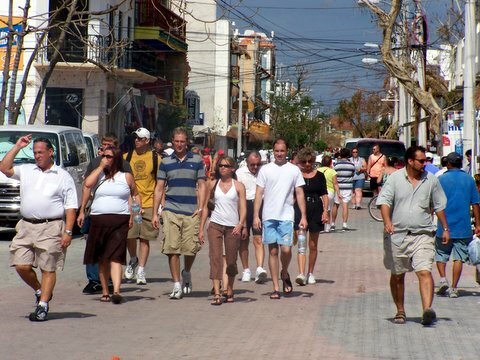 tourists and local residents to various cities near Cancun. restoration efforts and next steps. 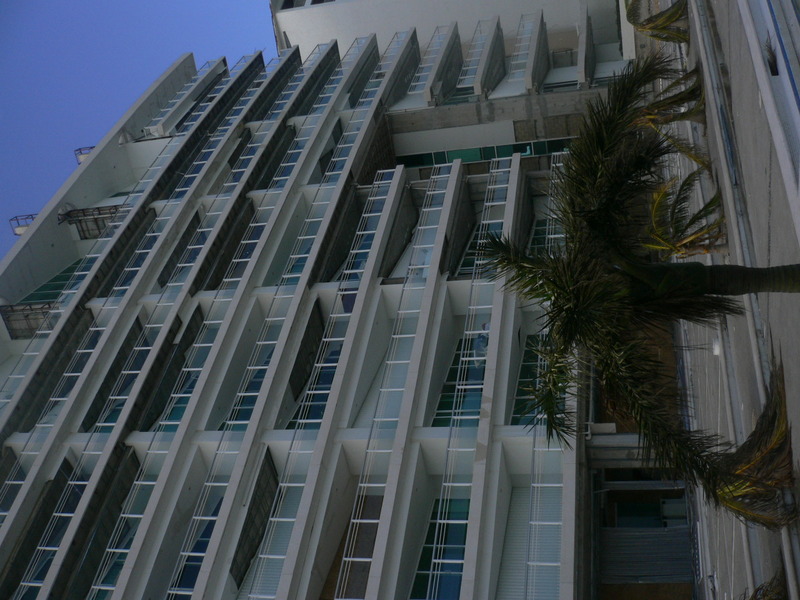 reopen 2,200 rooms by the December 20. 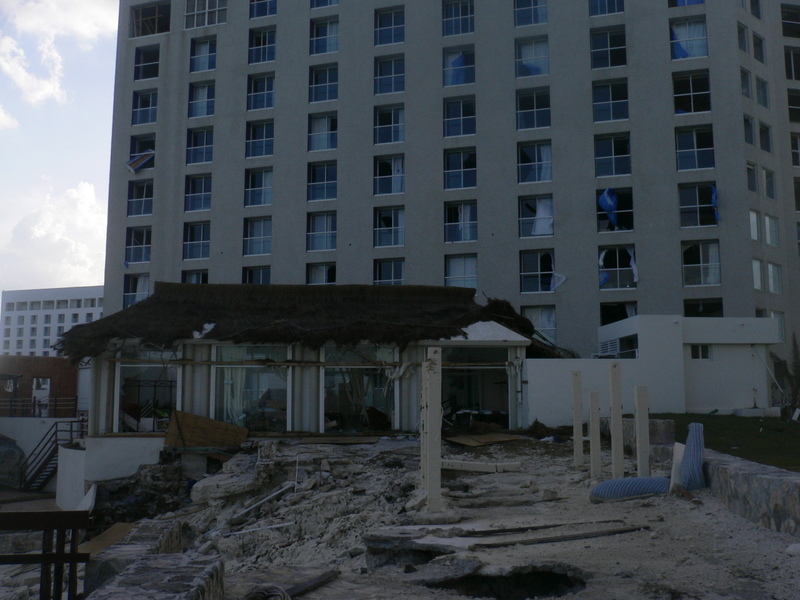 Cancun Resort are suspended until January 31, 2006.
http://cancun-cti.com (click on Hurricane Wilma update)." 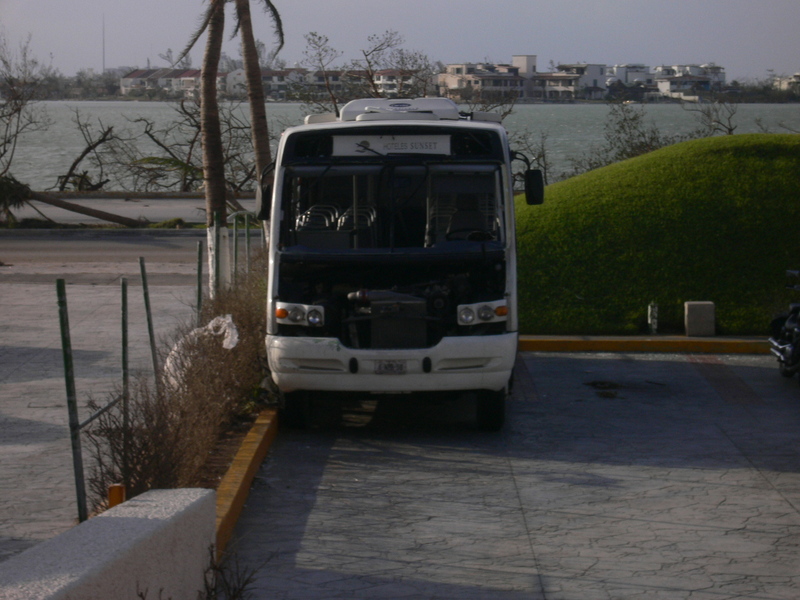 Cancun to pick-up passengers and bring them to the US. sand to avoid the fetid smell that already said good-bye. instruments and all the unimaginable things. front, the intact bust of Benito Juárez. embarkation of some 50 feet that rose itself in an area of concrete. damages, so much more partial and the other better damages. 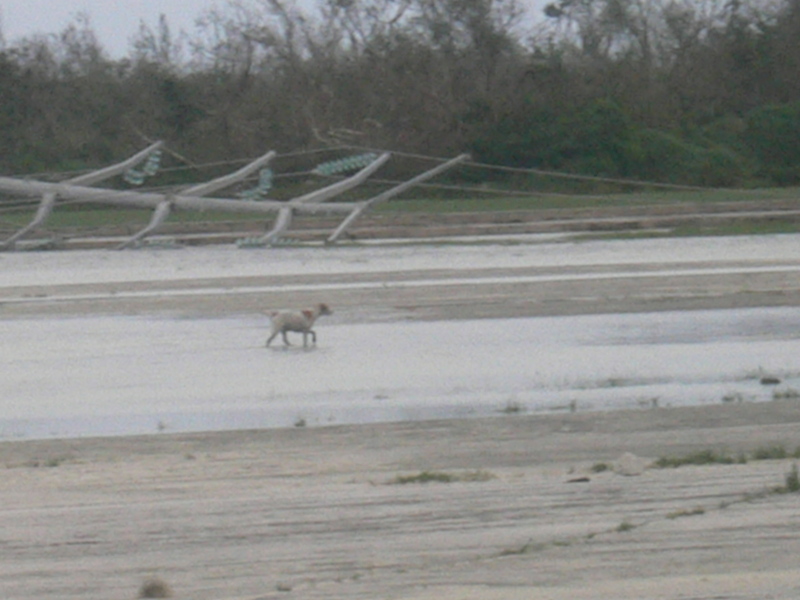 was with them) which went to Holbox yesterday found over there. 1.5 meter (5 feet) in the water. take pictures - I will send them to you as soon as I get them. waiting. 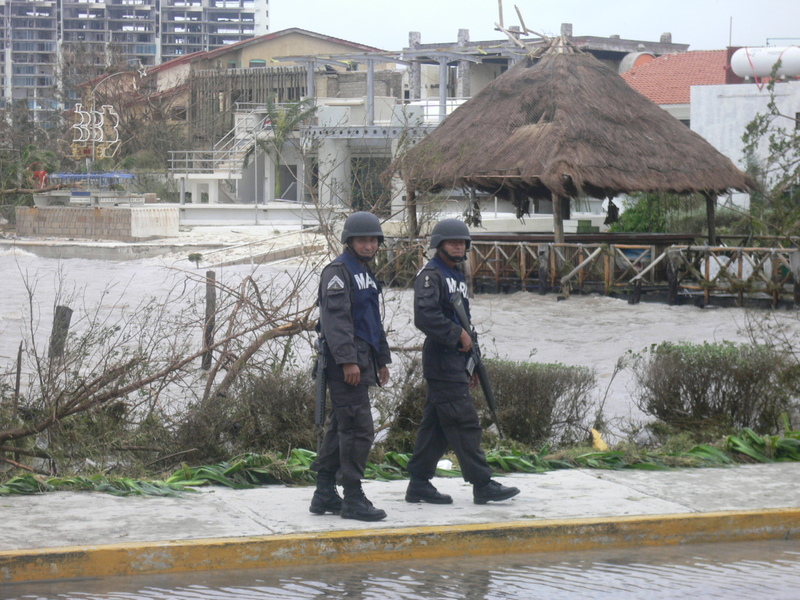 The rest of the men stayed in Holbox and started to rescue. I'm sorry not to have any news of your house I wish you good luck!!! informing us of their cancellation policy. These photos were sent to CNN yesterday afternoon at there request. I was asked to be on a LIVE call with them, but I declined. Emails are still coming in regarding specific hotels, properties, etc. 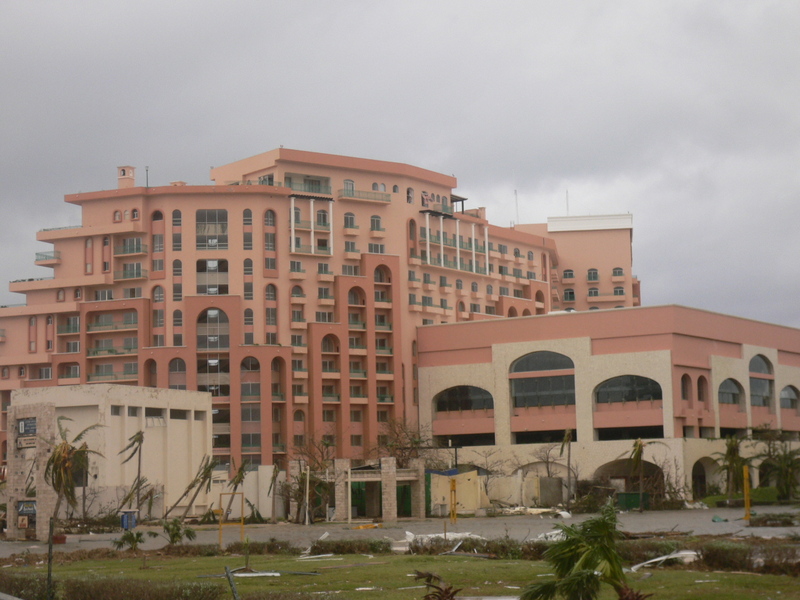 I have received MANY emails asking me about the Royal Resorts, the sands looks like it faired very well, minimal damage as far as I can see, same goes for Club International, however the royal islander, the royal caribbean, and the royal mayan MAY be damaged, as I have heard several people state that those hotels took a good hit from the storm. All emails I receive on missing tourists I send directly to a friend in the US Consolate, I can't post her email as she is too busy and she won't be able to help if she is flooded with emails. A couple large supermarkets have begun excepting credit cards, and parts of downtown now have electricity. Things are moving along. I am not sure if you guys have seen all these photos. If you have I am sorry to resend them. 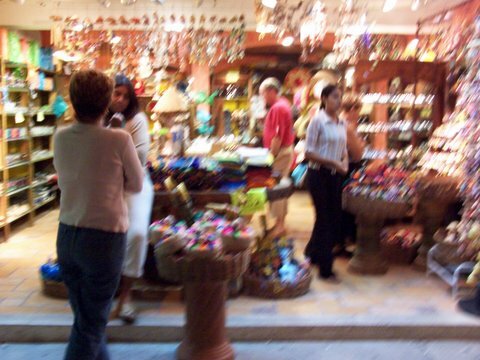 Order Prints of cozumel00's photos for yourself - your first 10 are FREE! Just click "Order Prints" while viewing photos to get started. return of tourist to their homes are moving quickly ahead. travelers can return home safely." the storm and are well supplied to accommodate guests. assisting guests with calls home to family and friends. provided as it becomes available. 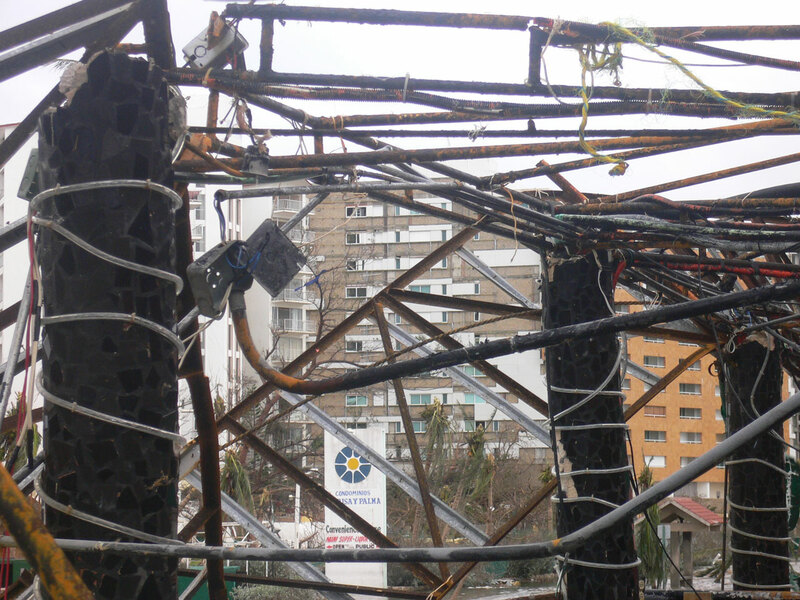 Piers have sustained damages but are still intact and are being assessed. 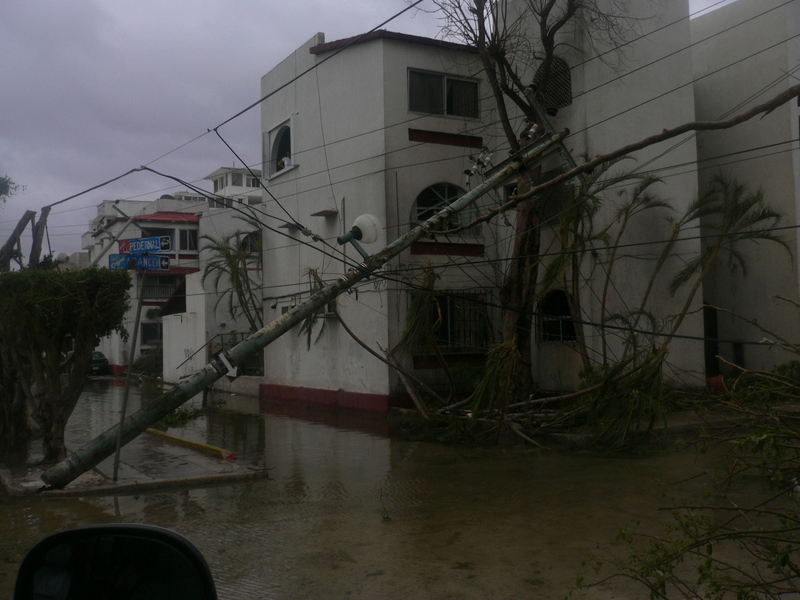 Here is an update on Puerto Morelos. Main road is flooded and still closed. 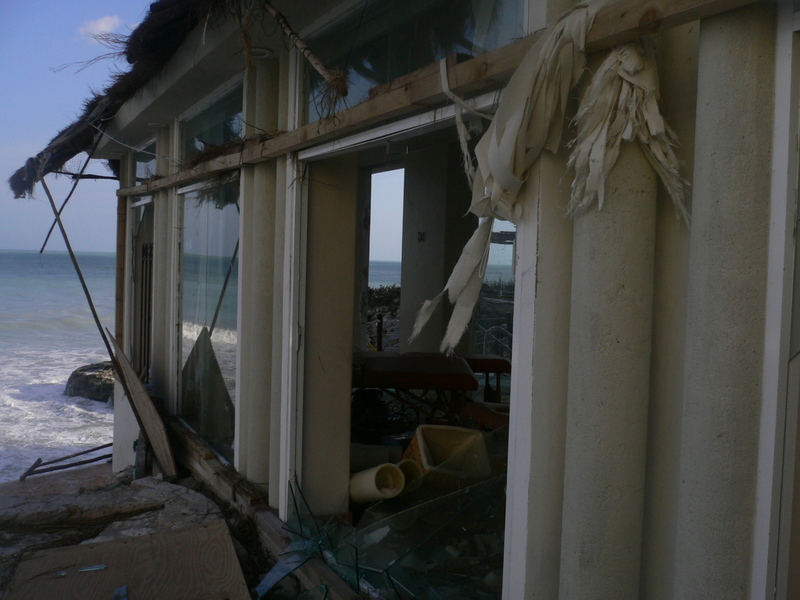 Damage to beach front homes extensive at first floor level. 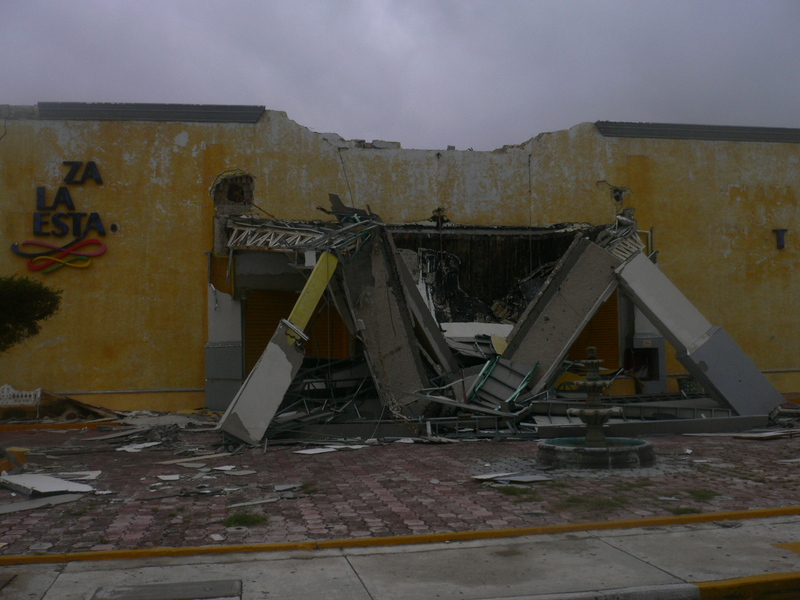 Pelicanos restaurant is gone in the village and the town South End end of the town square is gone. Dock is gone. Hola Asia and most of the shops and restaurants around the square are gone. The beach extends now for 100 yards--erroded into the land---everything on the beach looks like it is on a cliff and leaning or gone in to the ocean. 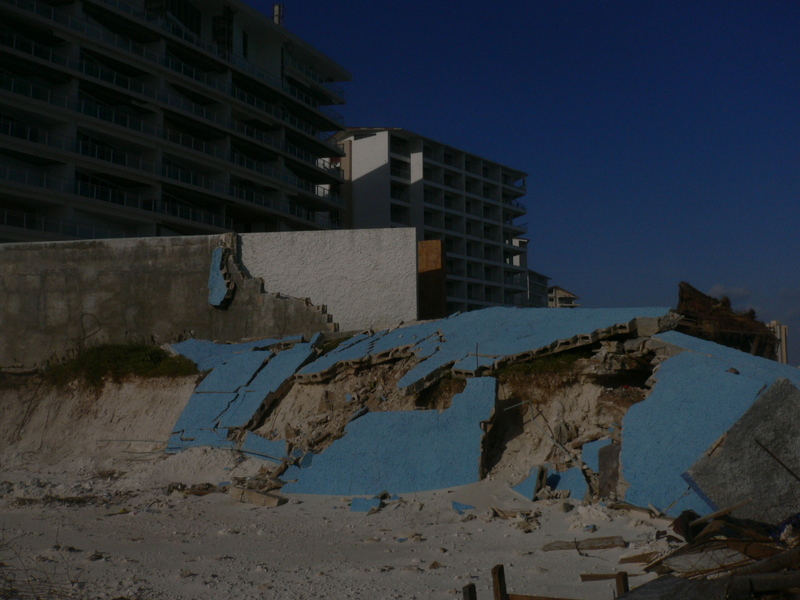 Most of the beach front stuff is either completely gone or will need extensive repairs. No electricity or telephone. 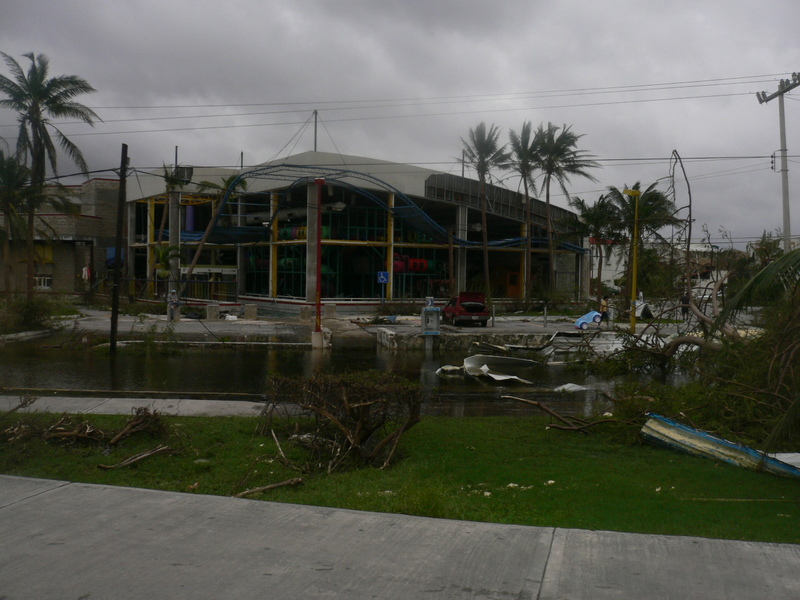 Villas Marina is pretty much gone. Unconfirmed report of Ojo de Agua destroyed. 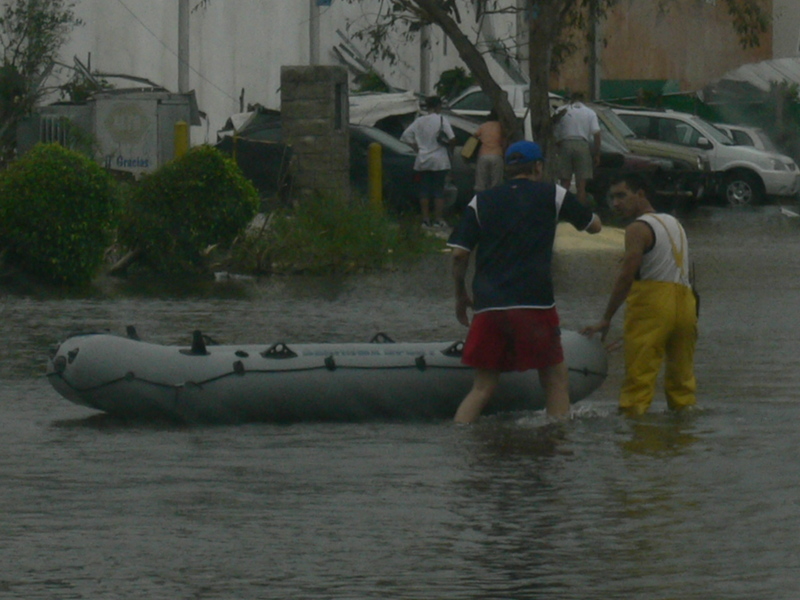 Niños Heroes St. was flooded in between Hotel Inglaterra thru Comex Store, the flooded water reached all the way thru la Tortilleria by the north of town. 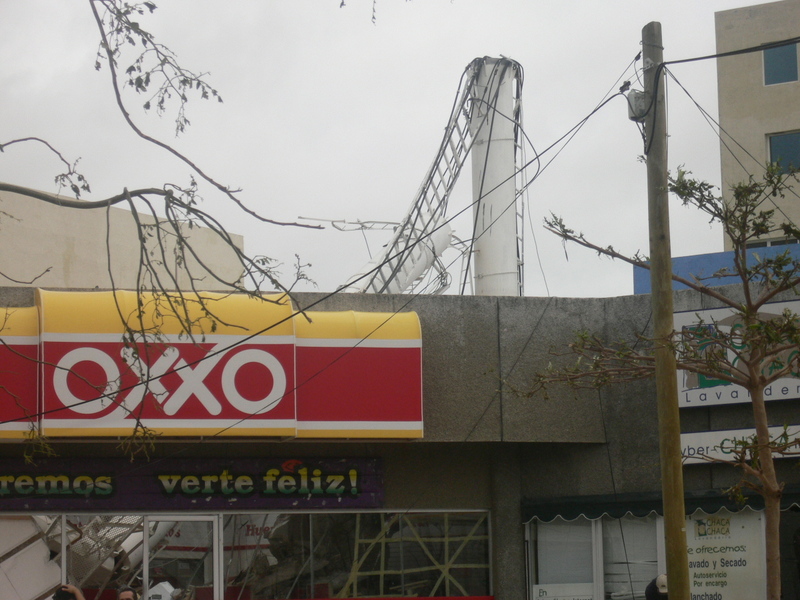 The Telemex antenna is still standing with no damage. Trees and comunication posts are down, of course, and no electricity. No confirmed reports of north end past La Ceiba. Costa Blanca by la Ceibb a survived. 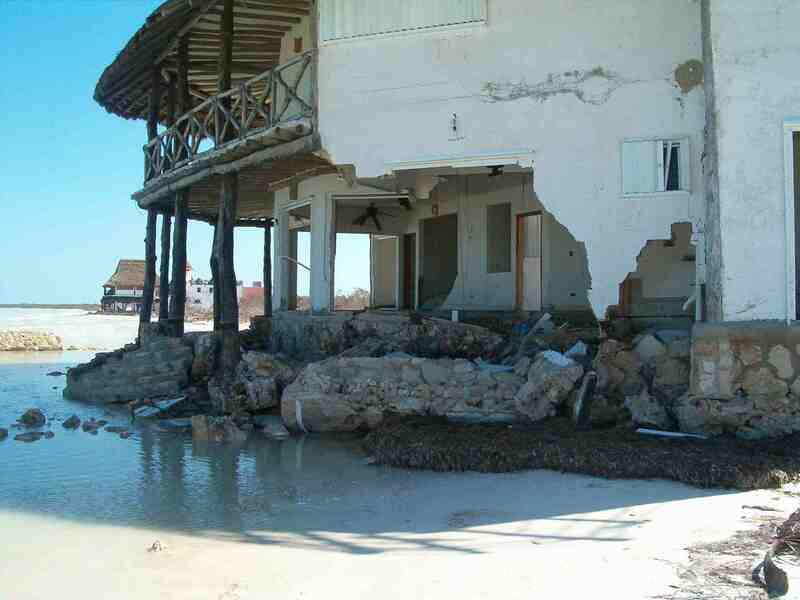 A few homes on Calle de las Palapas that were not on beach front survived including Costa Blanca. 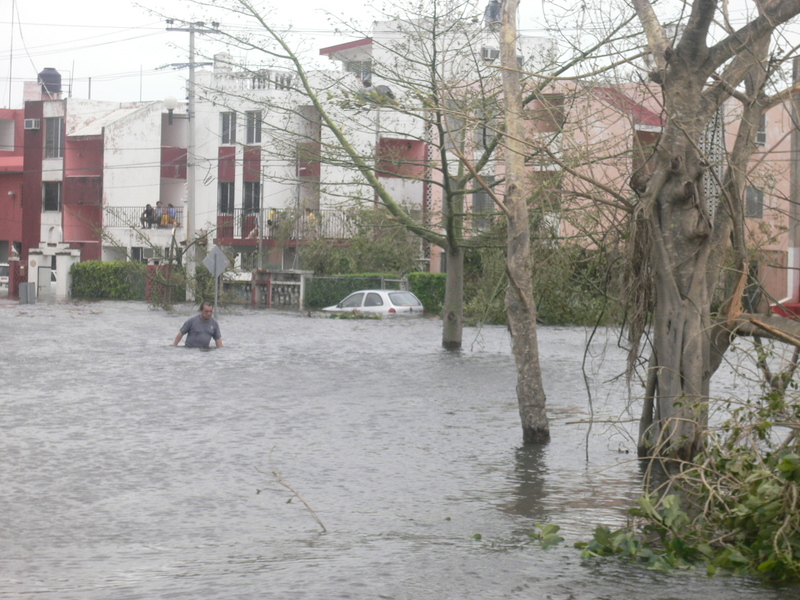 Colonia looks like a war zone--streets flooded. Non concrete houses all gone--no reported injuries. Big power transmission towers all down, wires and debris all around. No deaths reported. Hope all sorts itself out there very soon. Jon Kavanaugh sent me the following message. 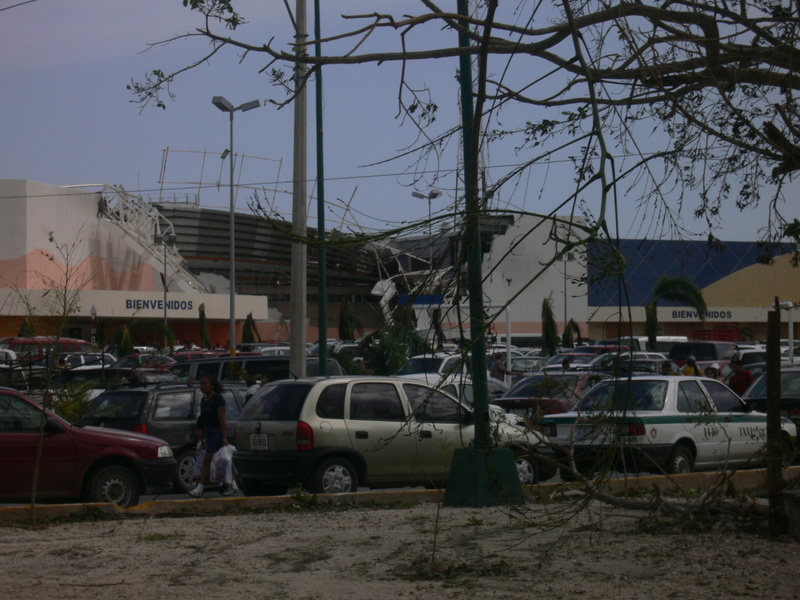 and Cozumel indicate no new guest arrivals before January 31, 2006.
businesses are open today and that most of the rest will open tomorrow. People are still e-mailing me for information about the Costa Maya. So, I thought I’d give you one more final report putting Wilma to bed as far as here is concerned. 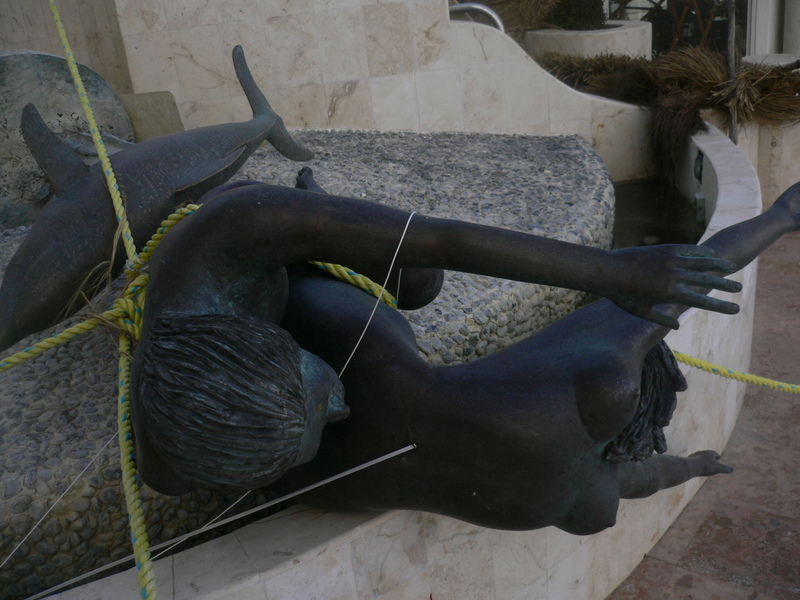 First, let me offer my most sincere sorrow for the folks in the Riviera Maya who Wilma really hurt. May God bless you all in your endeavors to recover. I will continue to pray your suffering will be shortened by God’s blessings soon to come. Monday, 24 October, 2005, for the first time in my life I was actually thankful to be bitten by mosquitoes. After nearly a week of near gale force winds, some, I think may have been of category one hurricane strength for about eight hours the wind died completely as the sky cleared with only a wisp of a cirrus cloud or two overhead. For me, Wilma is bid good riddance with the smart of a bug bite. At dawn, a warm orange bathed the horizon to the east, slowly creeping up to almost forty degrees before that lucky ‘ole sun came smilin’ his way up in his golden splendor. Seas so calm, not a sound echoed across the crystal turquoise Caribbe as if saying, “It’s over!” Yes, the mosquitoes are welcome but, only for the first few minutes – time to break out the DEET. 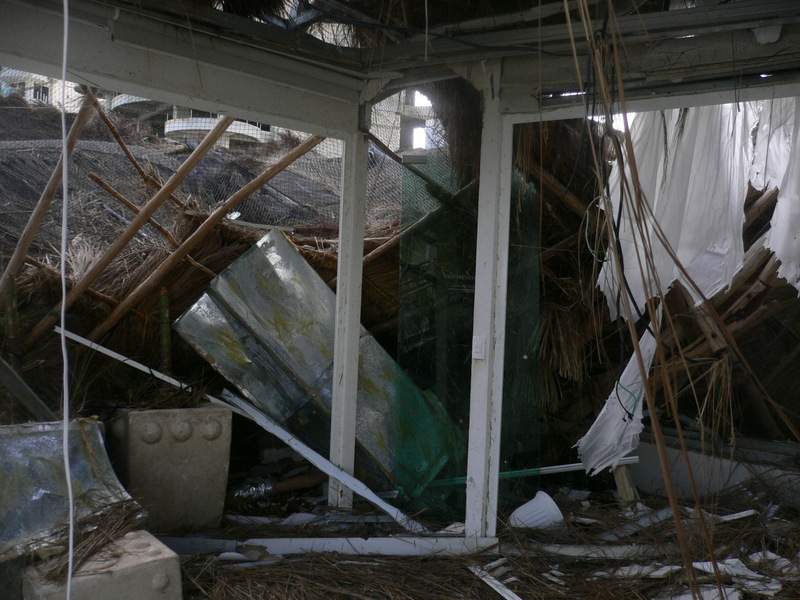 Damage here is minimal compared to the folks up in the Riviera Maya. I now have a giant, maybe ten ton log for a bench about twenty five feet from water’s edge as a reminder of the massive waves that smashed into the Great Maya Reef, 800 meters to the east. I think, when the water Wilma has sucked out of here in her departure returns, I will find I lost a couple of meters of property. Every one of those girls takes a little, this one was indeed greedy. 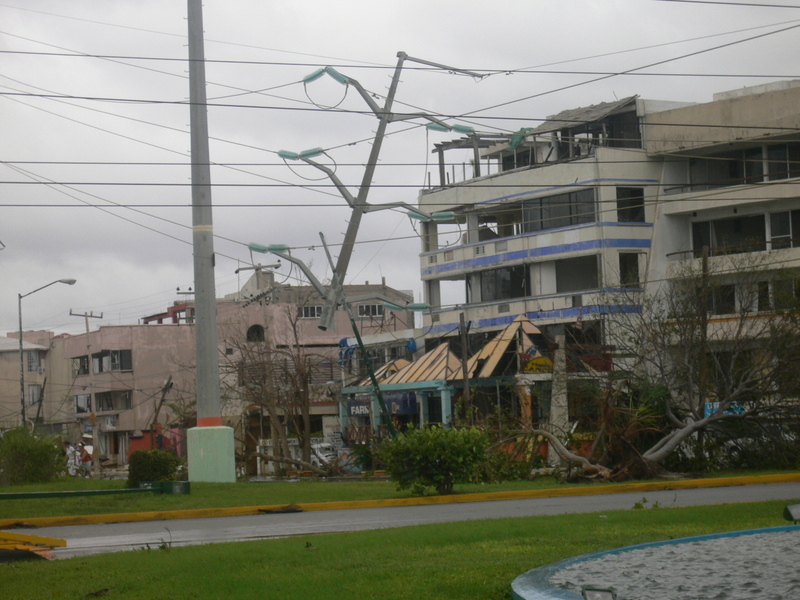 The area hotels, restaurants and tiendas, along with all of the local’s homes suffered very little if any damage. Essentially, Wilma is merely a memory here. Of the reef, I do not yet know. The tide is so far out, if it weren’t so mucky, I could almost walk to it. I imagine much of its beauty is diminished judging from the stench of dead marine life along the coastline, mostly from soft corals and sponges rotting in the sun. The thickest piece of hard coral I’ve seen in my beachcombing on the beach was about five inches thick at the break – a pretty brain coral that took hundreds of years to grow. Such is the way of nature. Somehow, she will recover and emerge even more beautiful in the future. I do find it strange she recovers from her own disasters much faster than from the ones caused by man. Back in July, Emily a storm as powerful as Wilma, though not with as low of a barometric reading, followed a track not terribly far from the road Wilma took. 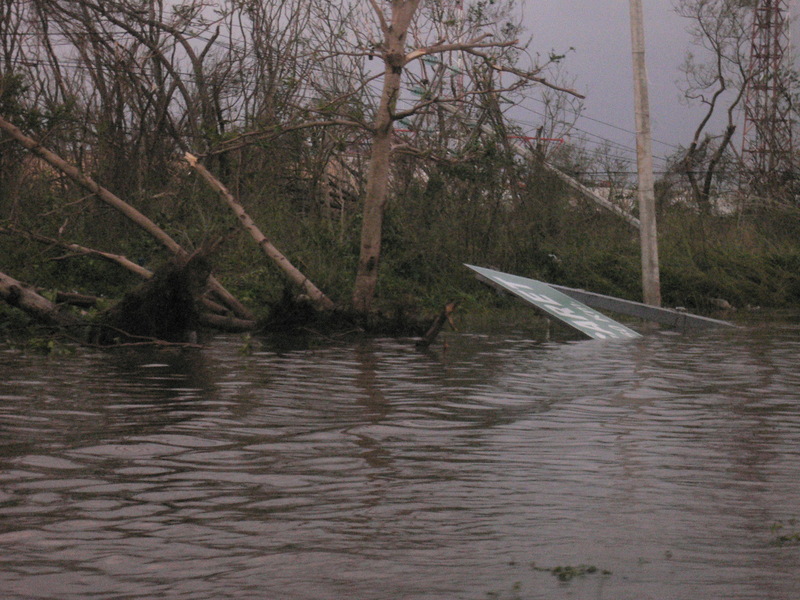 The aftermath of Emily along the Riviera Maya caused me to think of God taking a God sized lawnmower across the jungle north of Akumal. “Deforestation” was the term used to describe the damage by most. 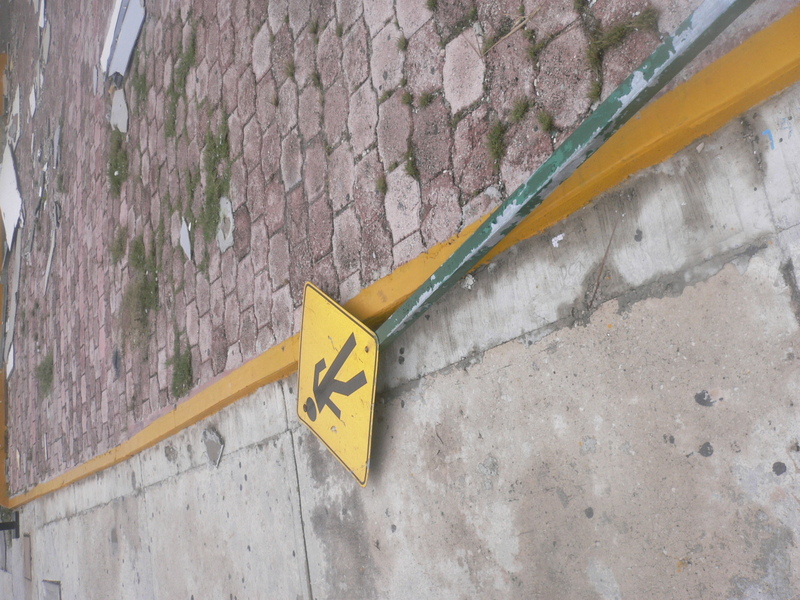 In Cancun centro, I saw a five foot diameter tree uprooted along a sidewalk making ramps a kid with a mini bike would terrorize his parents launching on. Nonetheless, most of my friends who live in Cancun when speaking of Emily said, “It wasn’t that bad.” Emily came and left in a matter of hours like a at minimum, polite girl. I think it was Ben Franklin who said, “Company, like fish, stinks after three days.” Wilma long overstayed her welcome and the stench remains after she has departed for the E.E.U. Even now she tears at the heart of Florida. In observing hurricanes for maybe forty-five years, many first hand. I find much more emphasis in terms of “fear factor” is placed on the “Category” of the storms. The sheer velocity of the winds is what the press is apparently most impressed by. 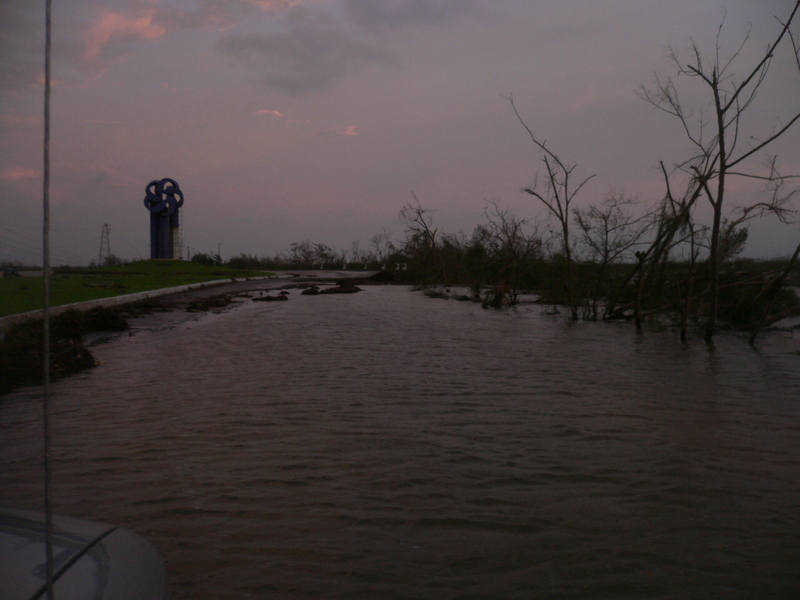 The water shoved ahead of the storm, called the “surge” is sometimes mentioned as the most deadly part along with tornadoes spawned. After Wilma, I do hope all who may encounter tropical storms in the future (I sincerely hope we are done for the 2005 season.) realize the forward speed of the movement of the storm is also very important to be aware of when considering evacuation. A slow moving storm of minimal strength can do more damage over a longer period of time than the most powerful storm that rapidly comes and leaves. 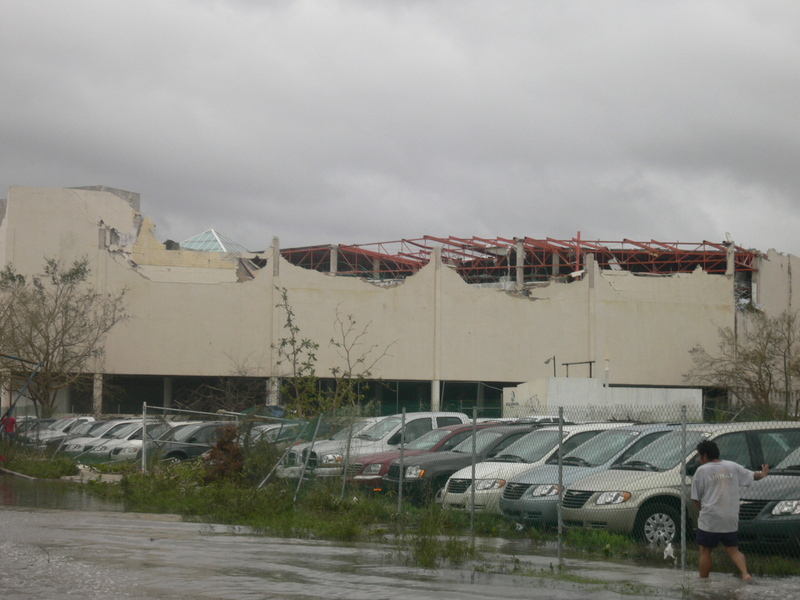 Tropical Storm Francis did more damage to Houston, Texas than did Hurricane Rita. I wish all of you the best of luck in the future. Keep an eye to the sky. My paradise has little to recover from and I thank God for that! Read my latest mystery, adventure, terrorist book, DARTS, free! I have managed enough sun to put a good deal of it online. I just received a phone call from my mother who works for Atlantis submarines in Cozumel, She said there is a lot of damage to the area (which we already know) but there is a payphone in town that works and a very long line of people waiting to call their families. So if you haven't herd from family members yet they are probably in that line. She said she had been waiting there a VERY long time to call me. cancelled thru Thursday as of now. >>>Resteraunt on the main drag in Coz. >>>found a live phoneline to dial out of on her modem. 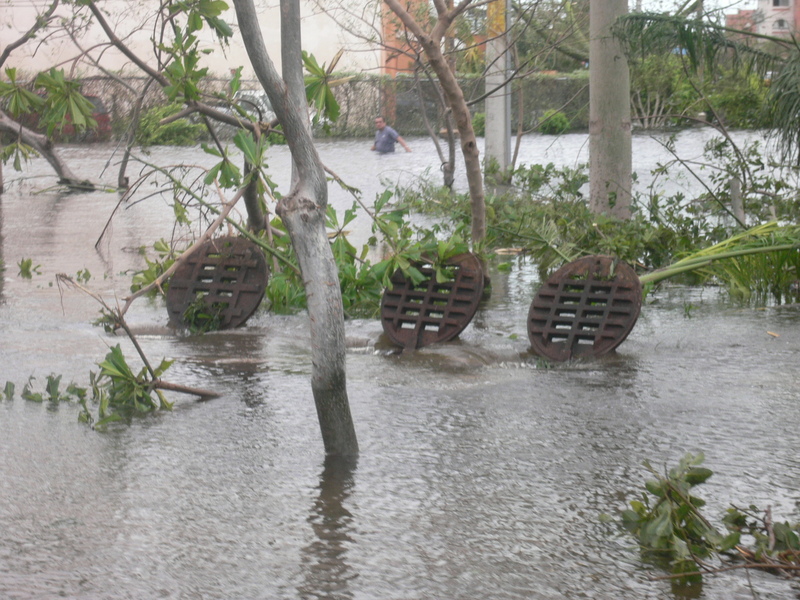 While there was much rain, it was not as much as tropical storms that we frequently experience and flooding from rising water was not anything out of the ordinary. 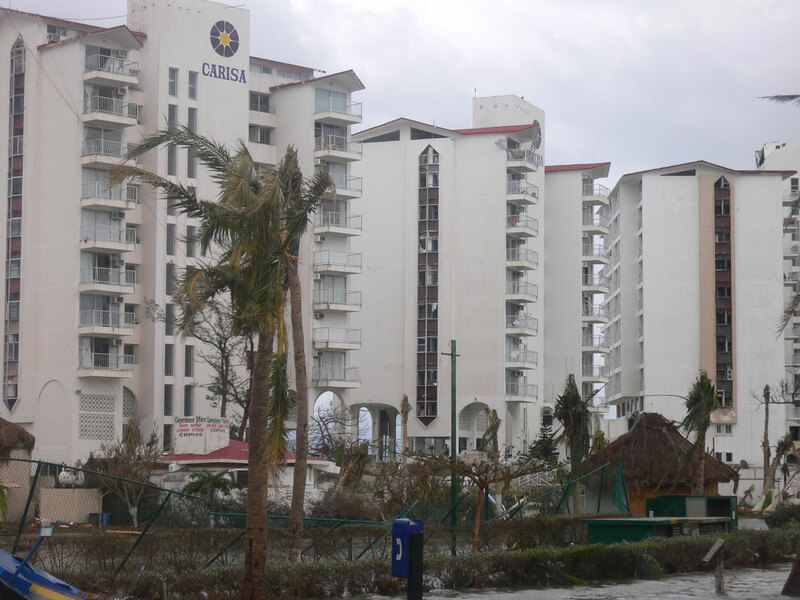 All waterfront hotels to the south have suffered catastrophic damage but the extent is not known at this time. Day beach resorts where our surface intervals have been taken are certainly damaged if not gone. 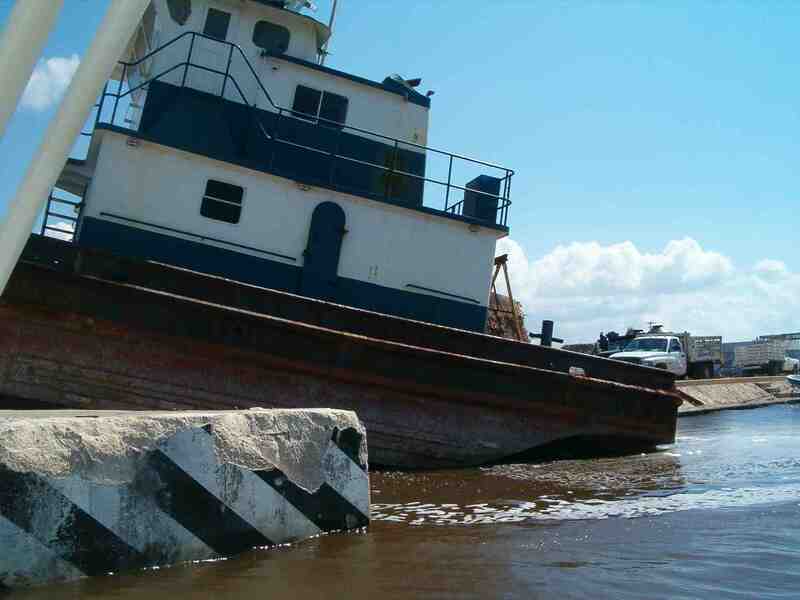 Caletta Harbor suffered severe damage to many boats. The Living Underwater boat is sunk and lies underneath a huge Dive Paradise boat which is upside down. Most if not all of the Dive House boats are wrecked/sunken, as are most of the boats in the harbor. Puerta Maya has disappeared. That includes the buildings and the pier. Paradise Reef is now safe from Cruise Ships. 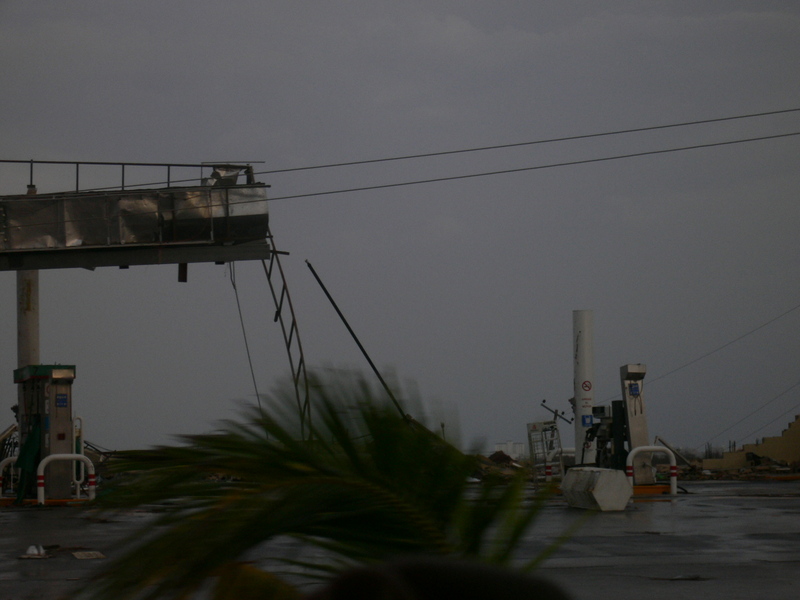 Car and Truck Ferry Pier is damaged limiting the arrival of supplies. The International Pier (for years the only cruise ship pier) is damaged and missing a section in the middle. 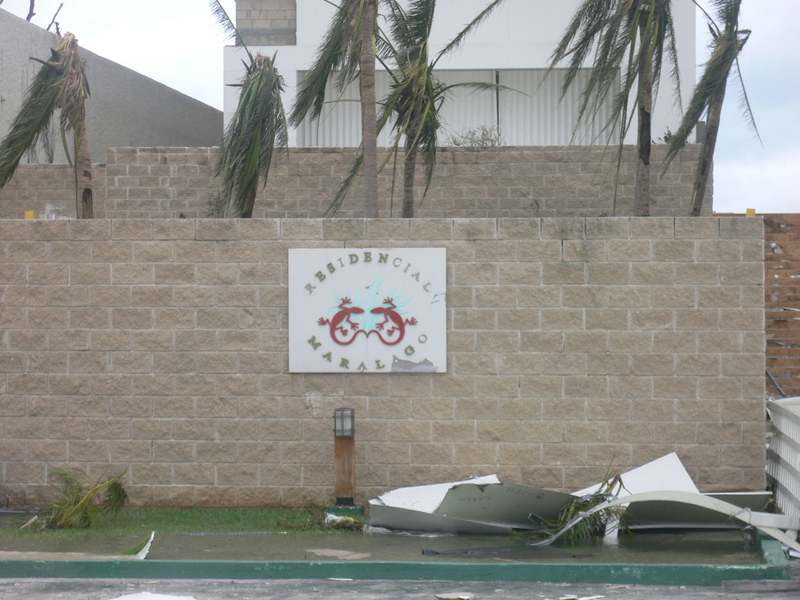 The dry marina (boat yard) next to Caribe Blu (still standing but seriously damaged), where many boats are stored on land, had a collapse of the boat hanger roof which crushed the owner's giant catamaran and the travel lift which is used to launch and retrieve the large dive boats. This means that it will be quite some time before the large dive boats in dry storage there can get into the water. The dry marina boat yard protected about 30 boats, and about 5 of them were damaged by flying debris or collapsed walls. All six of the Aldora Boats in the dry Marina are not damaged and using the forklift, can be placed in the water as soon as the authorities allow such activity. 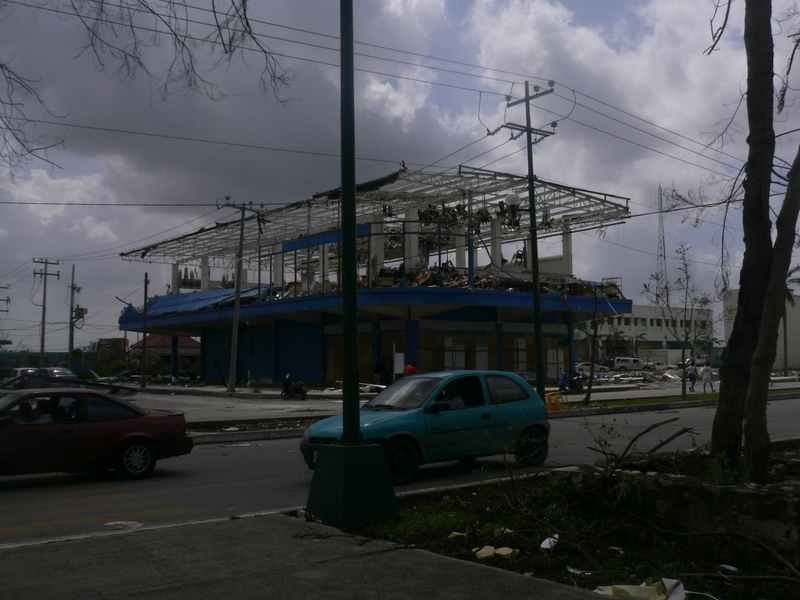 The new cruise ship pier downtown, Punta Langosta seems to be completely intact but the adjacent buildings and mini mall are seriously damaged. 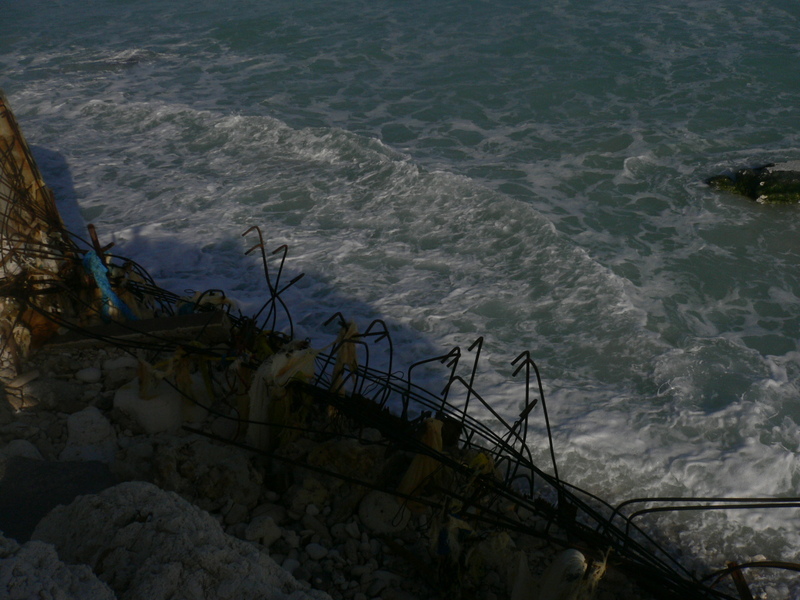 The Aqua Safari pier is gone as well as the remains of the Pro Dive Pier. The Aldora Pier seems to be ok and usable. The hotel Casa Mexicana is open and running on a generator. The Bahia and other downtown hotels seem to be OK and given electrical power and guests seem to be able to accommodate guests. 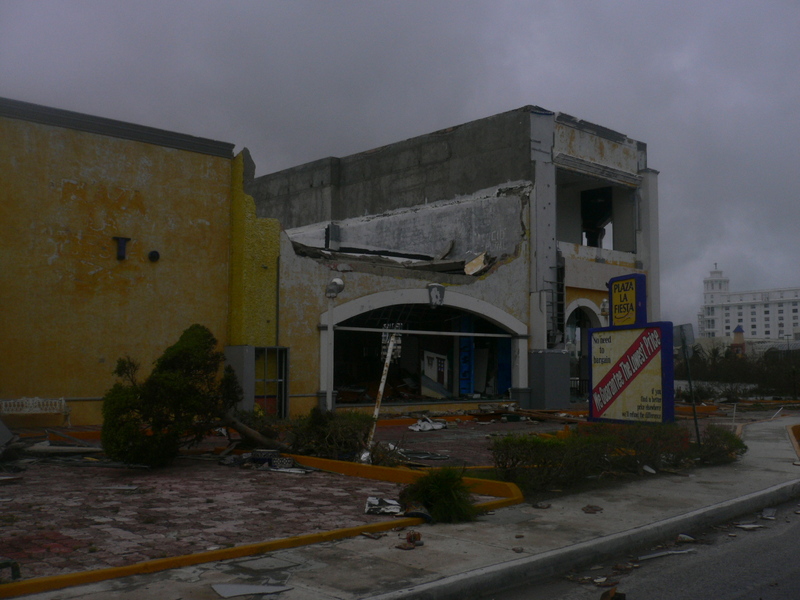 The Aldora office and shop on Calle 5, just ¼ block from the water's edge remained undamaged. 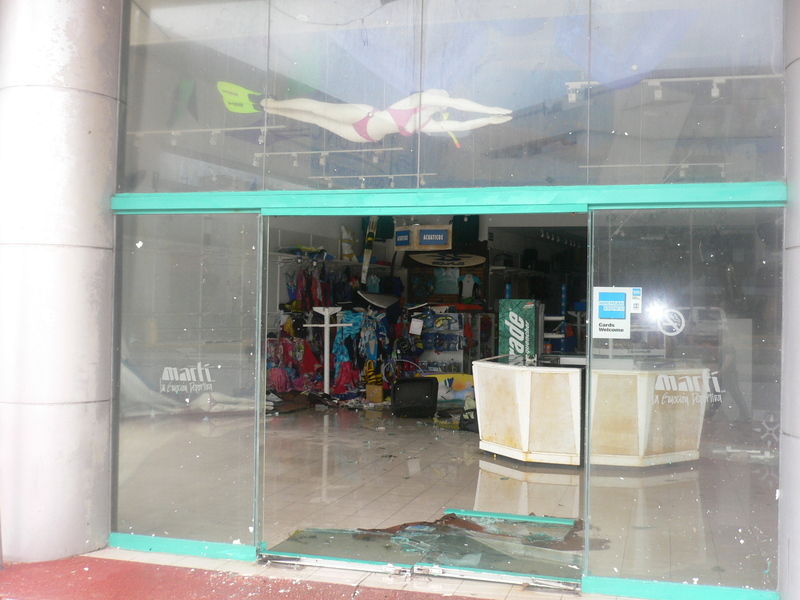 All waterfront shops on the main street (Rafael Melgar) suffered wave damage and burst open storm doors, with the contents spread out over the street. Some people have been picking up items from the street but it is not "wild looting" and the police are now patrolling the street where no one is allowed. 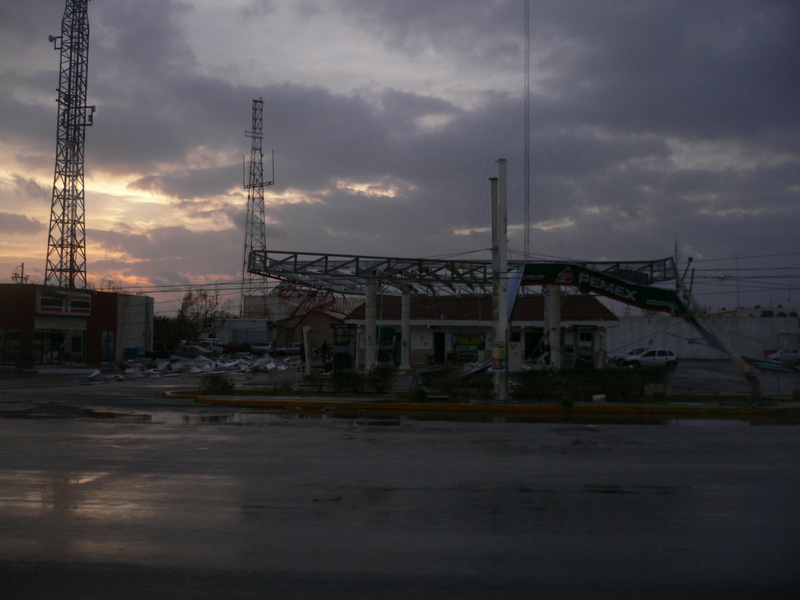 To the north side of town the waterfront damage seems less and Pancho's Back Yard and Cinco Solis seem intact. The airport runway is ok and can support flights but the control tower is damaged as is the terminal building. The Villa Aldora suffered some water in the beach level rooms but since we had moved all furniture into the Cameron Suite (furthest from the water and no ocean view) that all stayed dry. 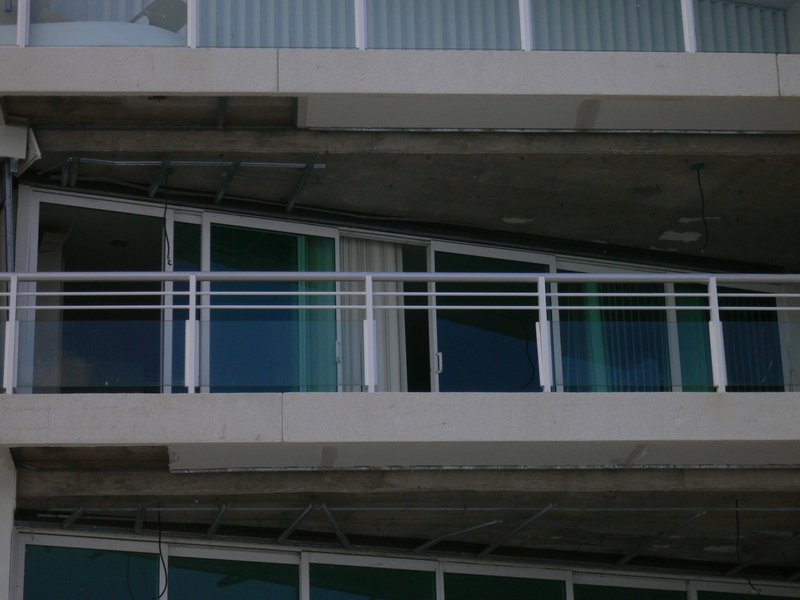 The Barracuda Suite had a broken window behind the hurricane shutters and the North Suite has a cracked sliding glass door. On the Villa Aldora Beach, the only thing left is the rocks that god placed there. Gone is the dock, palapa, retaining walls for our beach sand, the huge palms trees and the wall on the south side of the property. 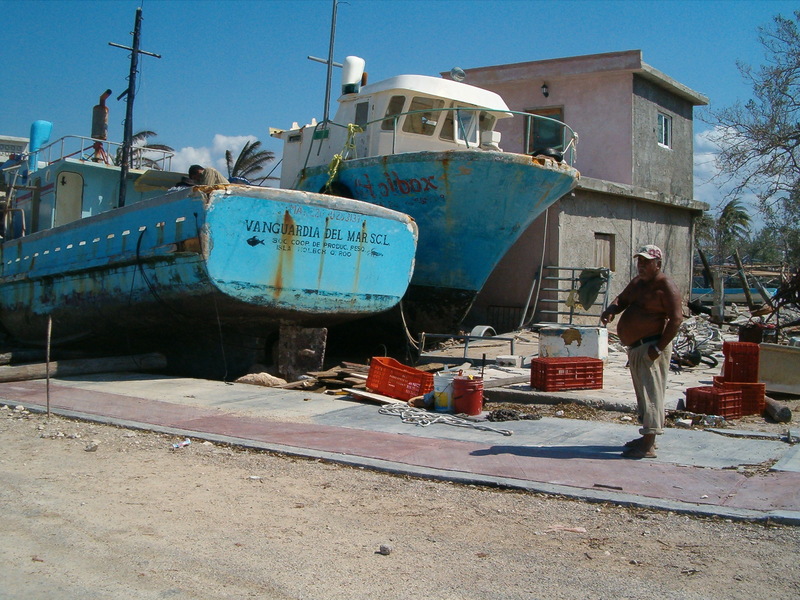 Puerto Abriggo, home to many of the larger boats, suffered many casualties too but we did not have time to survey them. Maybe 50% were damaged. Hotels to the north and structures on the east side could not be surveyed. 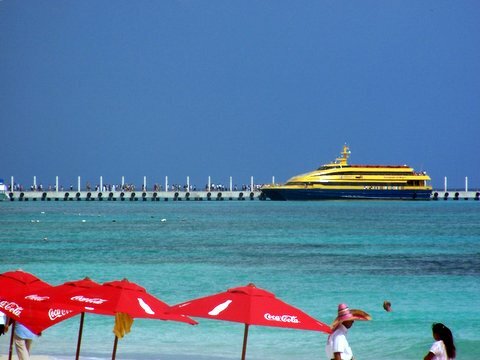 It is unknown how long a time will pass before a cruise ship can land in Cozumel. And if they could there is no infrastructure to entertain them. Of course they can revert to using a lighter to bring passengers in, and the shops may be able to sweep out their stores and replace the merchandise, but it will be a long time before the streets are crowded with them again. 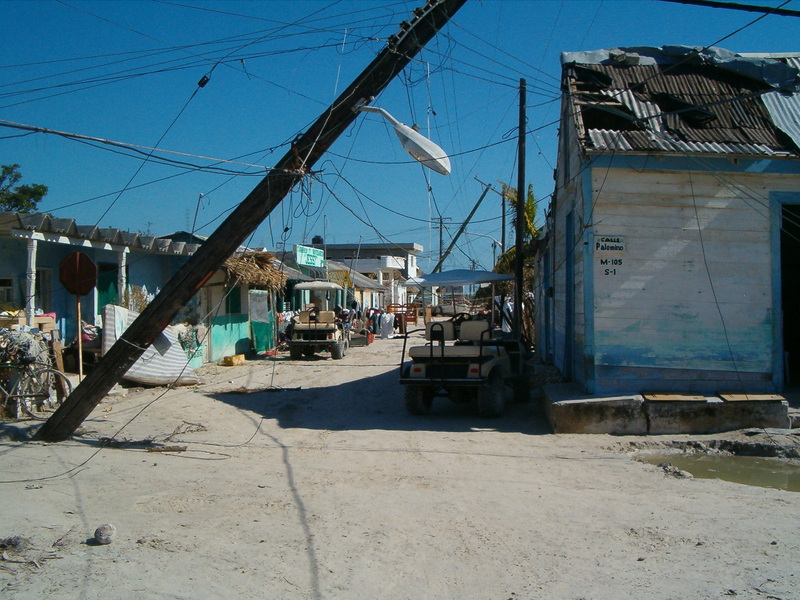 The restoration of power is a key for renewal of the Cozumel economy. Without power there will be no tourists so I am sure that the government will apply all energy that they can to get power up and running. Complicating that effort will be that Cozumel will be competing with Cancun for support and it may be difficult to get done as quickly as we have in past hurricanes. The good news is that the Governor of the state is a former President (mayor) of Cozumel and much of his staff is from here. With their friends and family in Cozumel I don't think we will be ignored. My best guess is that we should have power restored to most of the island in less than one week. There are two aspects to this, one is the quality of dives and the other is availability of dive boats. The dive quality will be reduced by very poor visibility for about one week. 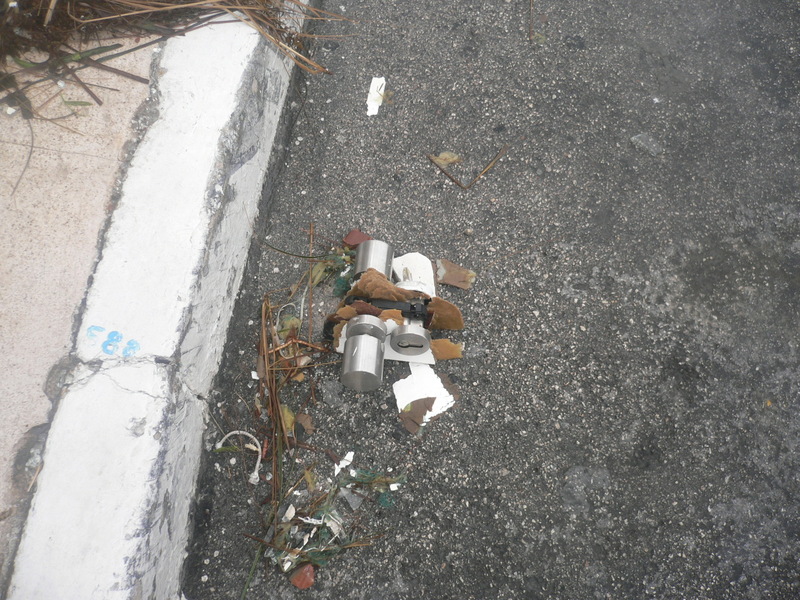 After that the current should have carried all the light debris toward Cuba. The heavy stuff may litter the bottom for a while, but given that there is not much development near the dive sites that should be minimal. The shallow dive sites may have been scoured but we have found that the fish life returns rather quickly after such an event. Expect finger coral and lettuce coral to have been hard hit. 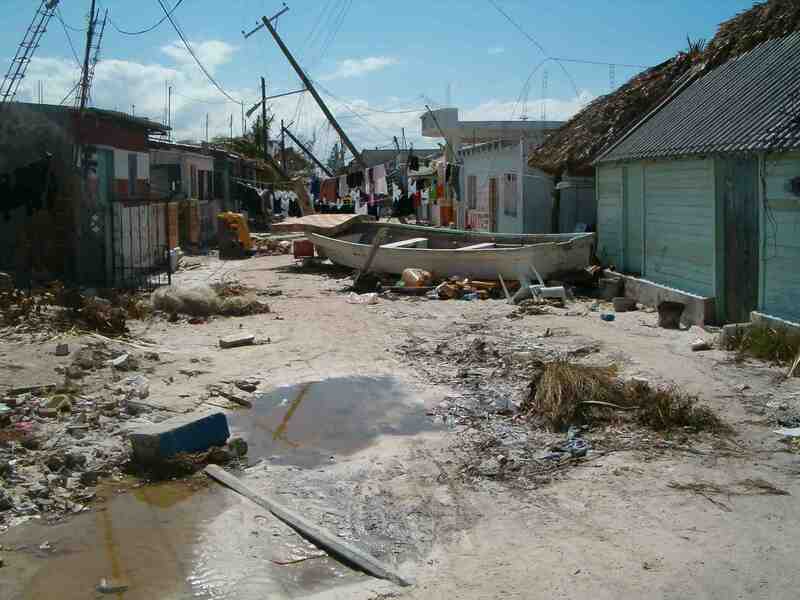 The deeper sites such as Palancar, Columbia and Punta Sur should not have been effected. We are very curious to see if the hurricane has mover the wreck of the C-53. As for our surface intervals which have normally been taken at a day beach resort, we will just have to revert to the ways we did things before there were piers down south. That is we will nose anchor out, backing in and raising the outboards in the shallow water. Lunch and drinks will be provided for a quiet beach picnic, blowing off the accumulated nitrogen. Many have longed for the way it used to be-here it is! The availability of dive boats will be an issue. All of the Aldora Boats are ready to go diving as we speak. However more than 50% of the fleet is now damaged or completely destroyed and it is difficult to determine how long it will take to get them all back in operation. Prior reservations may be a must do for divers coming to Cozumel in the coming months. Another consideration is the availability of power for the compressor shops. That should be going within a week. However, given the focus on "recovery" it is possible that the authorities may ban commercial activity for some time, and that usually includes dive boats. Given the problems with infrastructure in Cozumel the diving may, for some time, be just it was in the 70s and 80s--not very crowded and with a scarcity of cruise ship people roaming town. There are some among us who don't see that as bad. 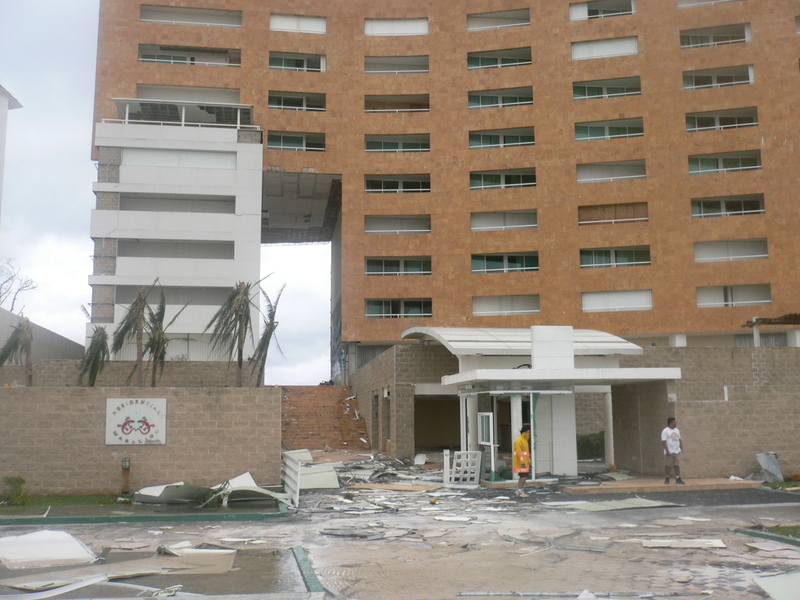 Most of the large hotels are severely damaged and some may not be reopened at all. My guess is that some may make it to reopen by Christmas. 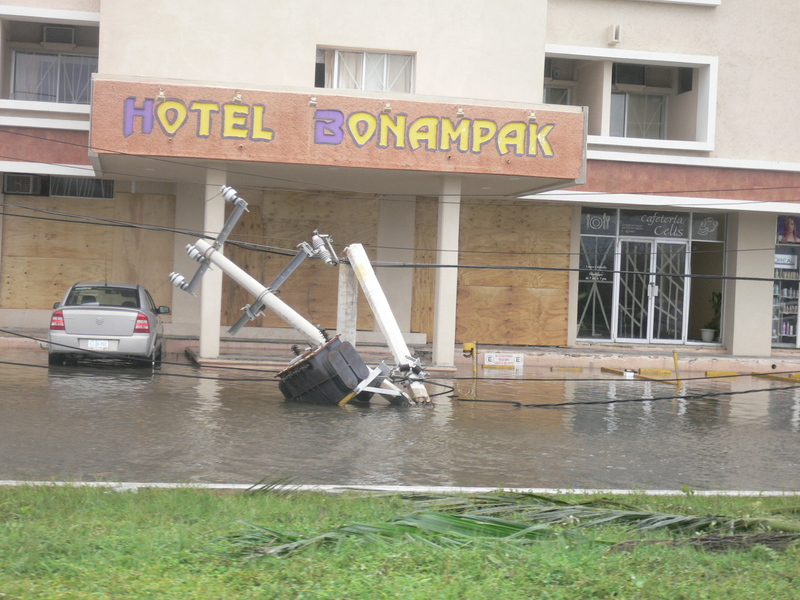 The smaller hotels around town should be able to accept guests as soon as the power is restored. 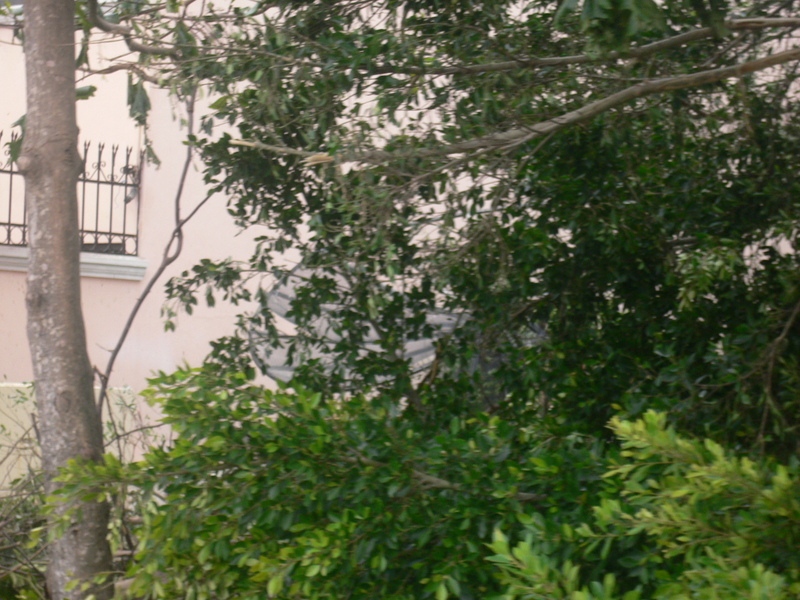 The Villa Aldora is operating on a generator now and could accept guests. This will be updated as more complete information is received. I am a recently arrived USAex-pat to Isla Holbox. I was back in the states when Wilma reared its ugly head all of a sudden, so I stayed in Tennessee rather than flying back as I had planned on Oct 18. Over the following days I watched the reports and satellite images from the National Hurricane Center, and followed the posts to stormcaribe and cancuntravelonline forums (thanks Kevin, Gene, Kenneth, Cliff and Mike, et al -- great stuff). I watched with growing horror as Wilma wiped out my 9-mo old investment in Paradise. I had planned to get hurricane insurance after researching the costs and reliability of providers, but hadn't gotten that far. Now I get to do the research by seeing which of my neighbors actually collects what they may be owed. Here is the latest from Isla Holbox. Maria Ros of Ecoaldea Gratitud is a close friend of mine. I have known her for 3 years, since I met her hitchhiking through Peru. She is a courageous Mexican woman out to transform the world. With UN and governmental support, she has been organizing a network of indigenous Mayan ecovillages throughout the Yucatan Peninsula. She called by cell phone last night to say she had not evacuated but had weathered the storm but that her own ecovillage-in-construction and the nearby town of Solferino where she had taken refuge were completely destroyed. At that time she was distraught, having been through Hell, and broke down into tears repeatedly. This morning she called again from Valladolid, three hours away from the coast, where there is telephone and some electricity, to say that she had decided to stay in the area to help with relief. She could go to her family in Mexico City but she chose not to. She only had 200 pesos cash but she has a credit card and can use that to get by, maybe find some paying work to repay it when it comes due. 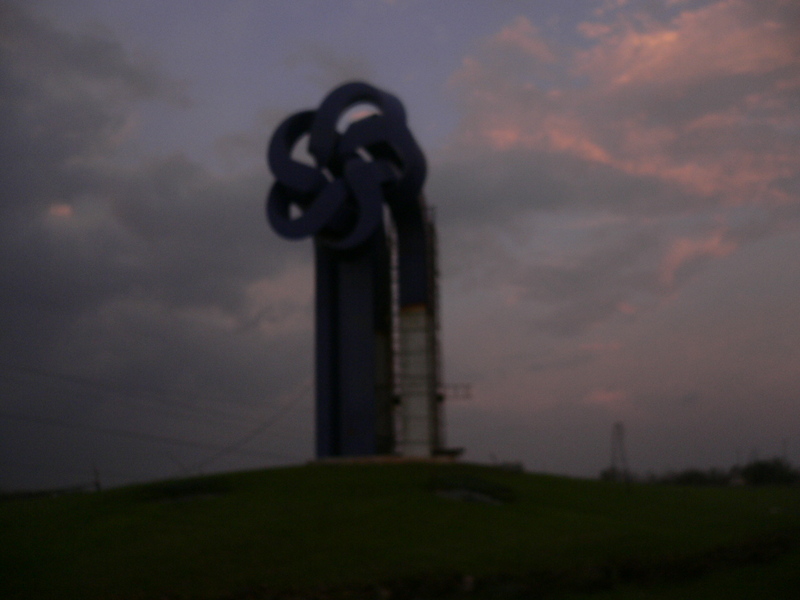 She says Solferino is wrecked and nothing of the structures they built on the ecoaldea land remains. Yesterday she went to Chiquila but could only get to the estancia on the South end of town, which is where the shoreline now was, half a kilometer inland from where it had been. She saw one of the ferries upside down on top of a building. 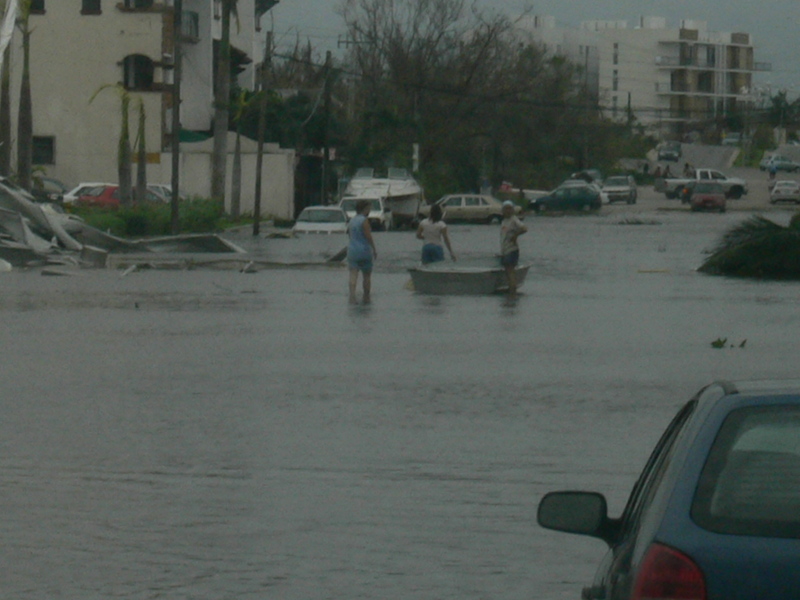 Everything in Chiquila was destroyed and it was under water still. 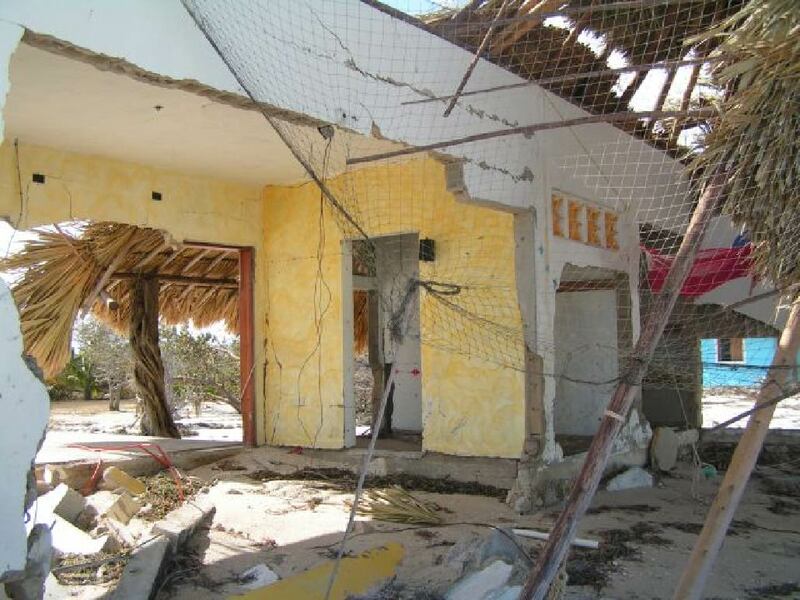 She says she heard from the Mayor of Holbox, Magrita, that someone had been over with a boat but that the sea had completely washed over the island. 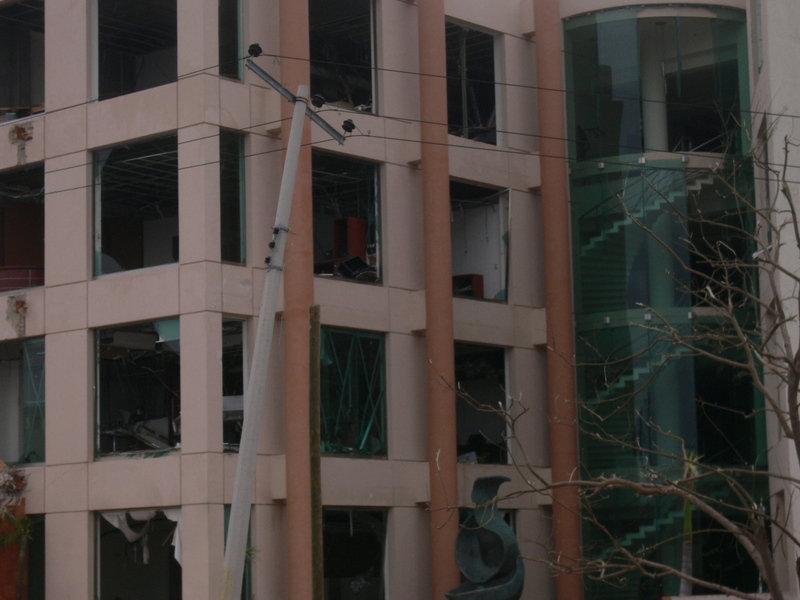 A few buildings were still standing, the mayor said. There are 20 people on a boat there that was shipwrecked and they were still awaiting rescue. Maria is spending her money to buy bottled water and Clorox to take back (to sanitize drinking water) to Solferino where the people are without food and water, anything not made of steel-reinforced cement was destroyed, and they have no way to leave or go anywhere. I can help to pay her credit card from here. Donations are welcome. The people need money to rebuild and she wants to organize work parties to clear the streets and pick up debris. If she can get donations she can pay the people to work and then they can get food and water for themselves. I told her to go ahead and organize that and start paying them something. The first rule of money: just do it, money will come. Our organization is a tax-exempt non-profit and can give tax deductions to donors. I can send out regular reports of progress from here. We'll start from where the people are in greatest need and work outwards. Anyone who wishes to donate to this starting relief effort can send a check or money order or credit card information to me. 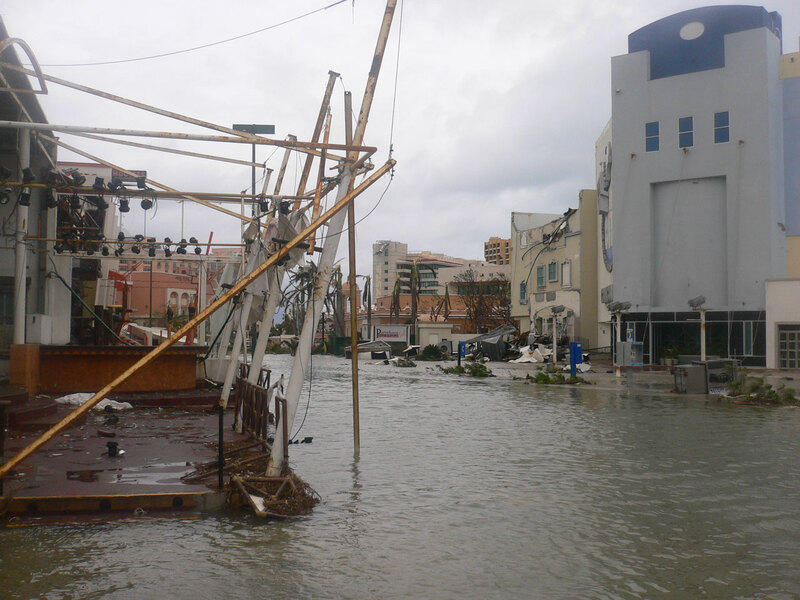 We are also part of Network for Good, so on-line donations to Global Village Institute can be made via PayPal or major credit card from our website at http://www.i4at.org/ Please designate Wilma Relief with any donation. If you will also let us know by email that you have made the donation, it will help us with our budgeting and we can email you a receipt for tax purposes. Thanks again to everyone who has supported this site. It has been invaluable. A whole systems immersion experience of ecovillage living, together with classes of instruction, access to information, tools and resources, and on-site and off-site consulting and outreach experiences. 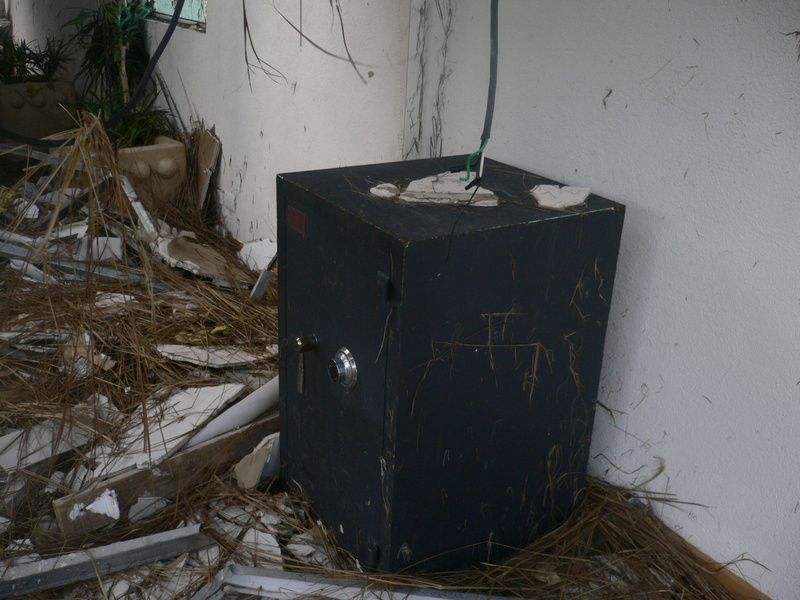 I have been receiving hundreds of emails asking me specifics on damaged caused to hotels, locations of shelters, etc. I did take a tour of downtown yesterday, and we did drive through the entire hotel zone, but it was dark, and as a result very hard to see anything to clearly. 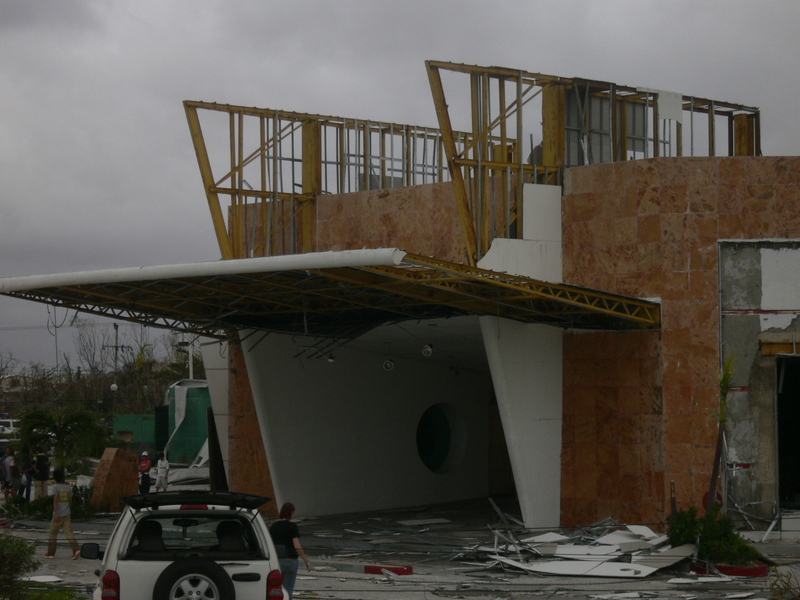 Most hotels/buildings had windows blown out, sheet rock paneling blown away, entrance way and/or lobby damage, walls down, but seemed to be ok structurally. We did not see any truly demolished buildings. 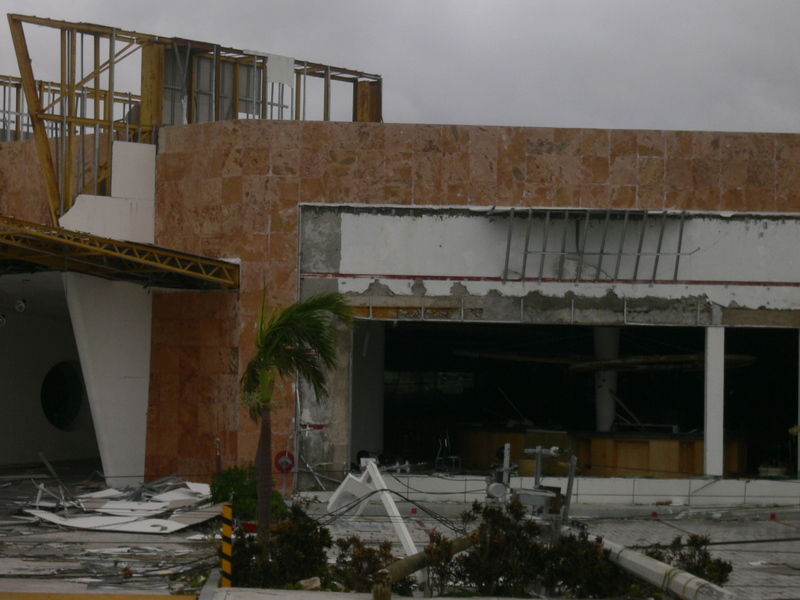 News is slow to come in, but there haven't been any serious injuries or deaths reported in Cancun, 10,000 tourists have been sent to Merida already to take shelter and try and get a flight home. 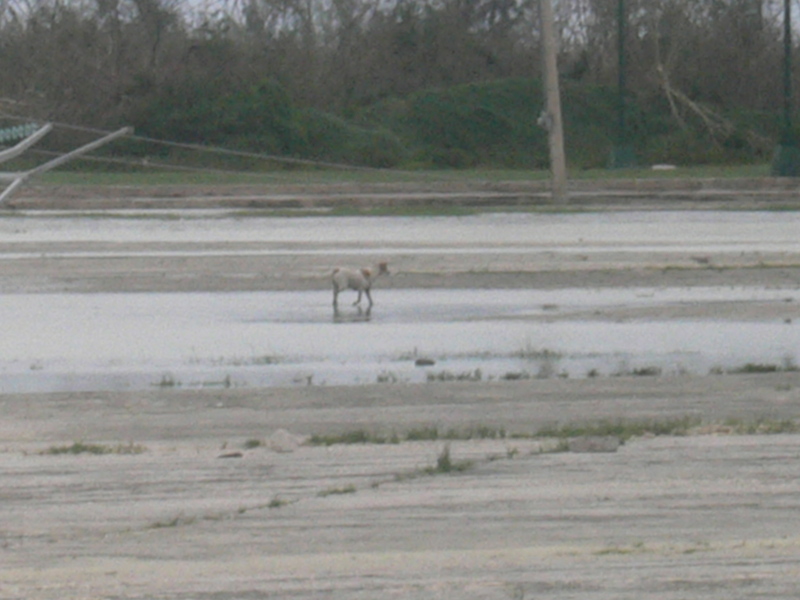 2 Pumas escaped from "Pepe's Tigers" here in Cancun, and are rumored to be in Bonfil, which is an area on the way to the airport. 100 convicts escaped from the local jail when a wall fell, after taking with a police officer at one of the checkpoints in the hotel zone I learned that a majority have been captured. 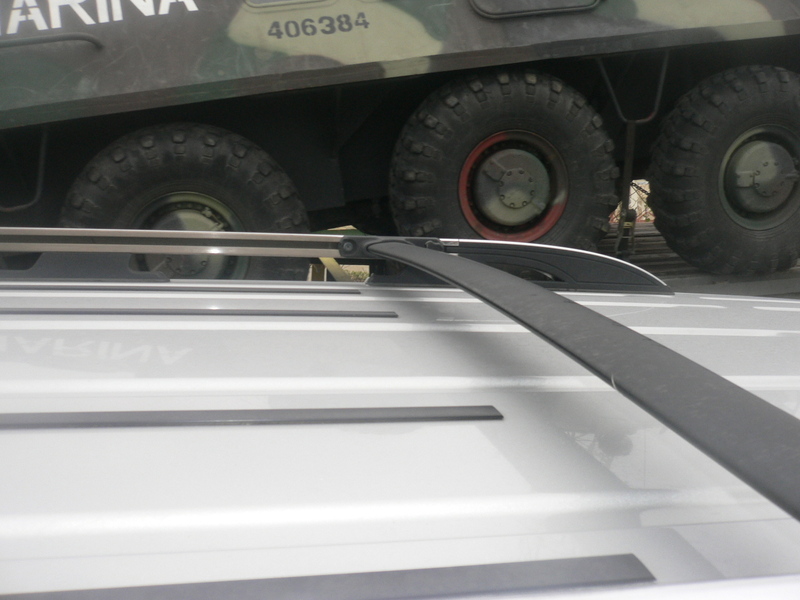 Looting was a big problem early yesterday, but the police and military have done a good job in controlling that situation. Work has already begun to clear the roads here, and traffic has picked up 10 fold. From our balcony we can see a few dozen workers on the street moving debris and trying to get things moving again. I wouldn't worry about loved ones here on vacation or residing in Cancun, the problem is communication. I can understand the worry, but try and be patient. Talked to my daughter again this AM. They have heard that two of the large cruise ship docks are broken into several large pieces, and a third pier is completely gone. The passenger ferry pier in the downtown is apparently intact, so once ferries resume, pedestrians traffic can also resume. But the car ferry is dependent on the cruise ship piers, and they are working on a solution as we speak. Meanwhile, the plan is to remove seating from the passenger ferries, and use the open space to bring in crates & supplies, in addition to people, whenever that can happen. 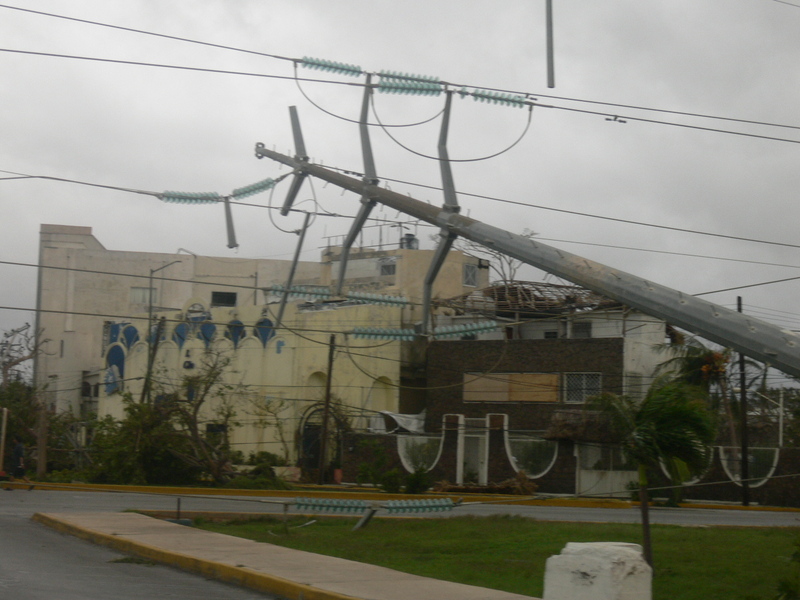 We are all okay and just got power last night in Playacar!!!!!!!!!!!!!!!! The storm was wild but we are all okay, we have visited everyone at Las Brisas condo and everyone is okay, some a little shaken up, windows blew out etc. 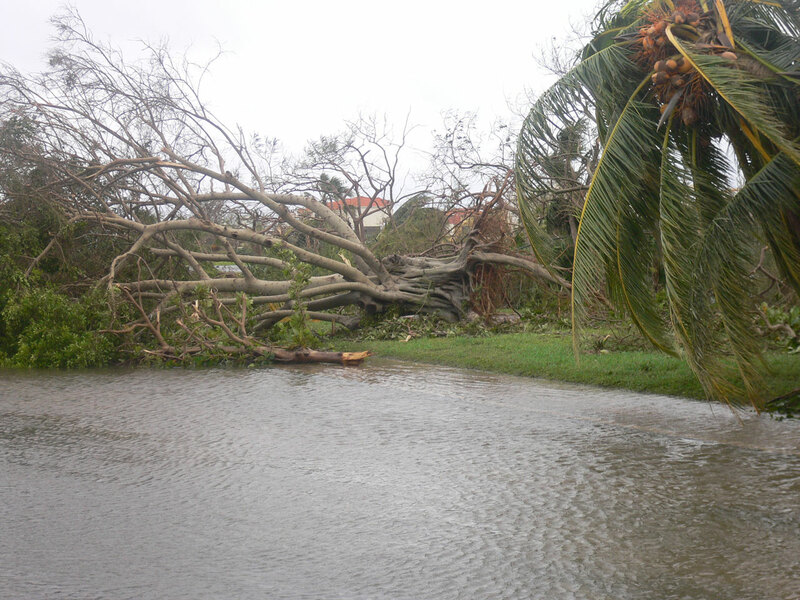 Mike and Crissy have the generator running, cold beer and had the tv on for the kids:-) We drove around yesterday and into Phase 1, all the homes on the oceans north of the reef club have been blown right through and the road is gone in sections. But the house behind seem fine. Better run, so much to do and I will post soon. Oh, to the person that emailed me about the condo she just bought, I drove by and all the units on the top floor were not boarded up and the windows are smashed but the lower units are boarded but may have some water from the upper unit so the quicker someone gets in to drain it, the better it will be for you. for people who have family vacationing here. afternoon. I am not sure what shelter they were in. We had 2 separate conversations with people on Cozumel today. I thought some information might be useful to post. Firstly, land lines seem to be working on the west part of the Island, as that is how we got through. In that area, there is waist deep flooding, and lots of debris. House was flooded, but was starting to recede when we spoke. Cinderblock construction houses have stayed up with minimal structure damage to the houses themselves, but damage to walls/gates around houses. Friends there are shaken, and said it was a horrible experience but have survived. In Corpus Cristi, most of same holds true. We only spoke via satellite phone, and it was a very brief conversation, but the same conditions there. 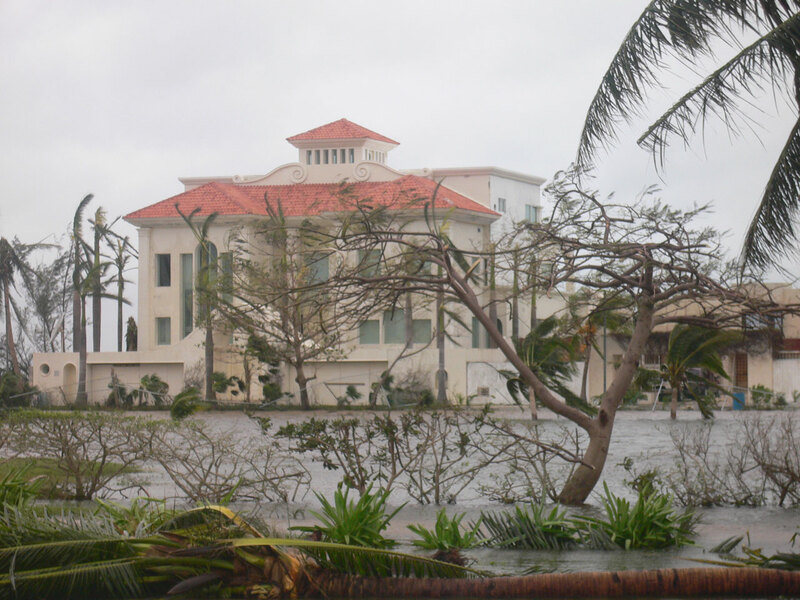 Flooding, no electiricity, no cable and no landlines on that part of the island. Only outside damage they've heard is that the road that runs along the south shore of the Island is gone. Not much information here, but there is so very little information coming out of Cozumel, I thought any news would be something. We just were able to get out of the hotel zone and check on some properties downtown. Some areas are under 6 ft of water, while some are dry. We passed a few shelters and everyone seemed to be getting along ok. 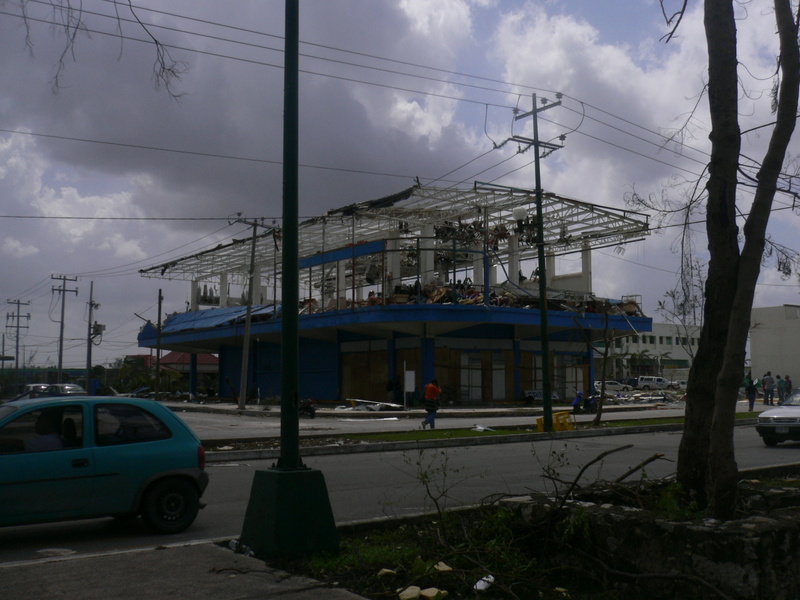 Some of the larger local supermarkets were giving away supplies, though there is looting going on. I took a lot of photos. I only have about an hour till the generator is turned off, so I may not respond to all the emails I received. We are ok, and plan to leave the city in 2 days or so. I will try and send some more updates. 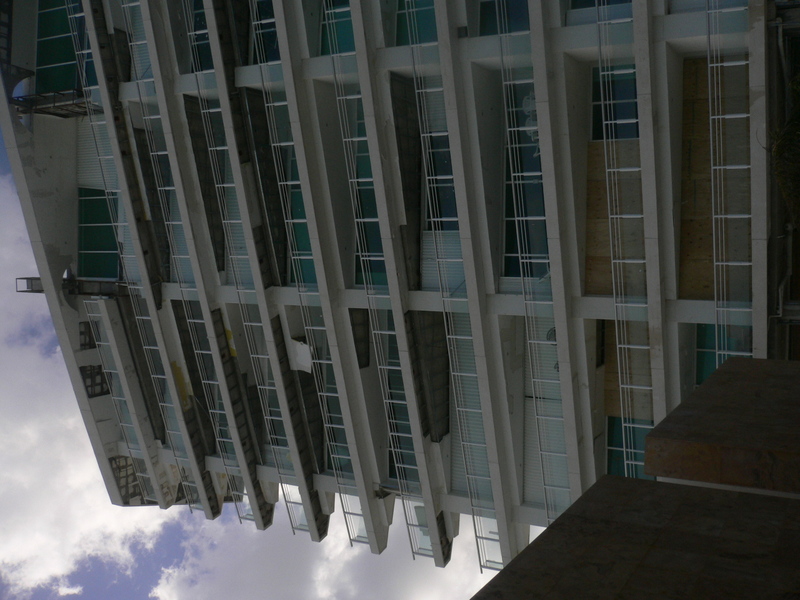 I was asked how the Salvia Condominium was, I took a few pictures, it is in bad shape, but structurally it seems ok. 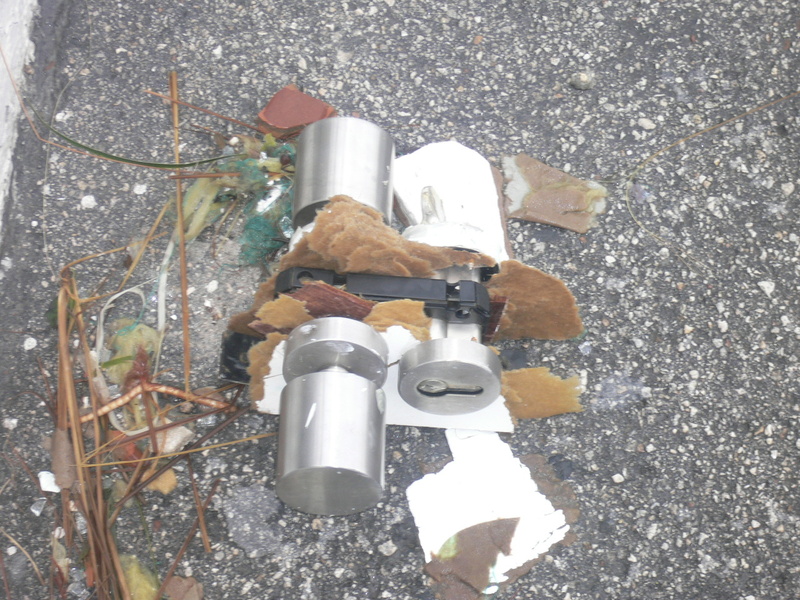 Note the photo of the door knob, I found it about 500 meters from it's original location in Punta Cancun, the white building with MANY blown out windows.